In pursuance of the provisions of the Local Government Act, 1993 and the Regulations thereunder, notice is hereby given that an ORDINARY MEETING of Penrith City Council is to be held in the Council Chambers, Civic Centre, 601 High Street, Penrith on Monday 20 February 2012 at 7:30PM. Ordinary Meeting - 6 February 2012. Local Traffic Committee Meeting - 6 February 2012. Policy Review Committee Meeting - 13 February 2012. I wish to acknowledge the passing of a St Marys stalwart, Isobel Lowe. Isobel, with her husband Neville, was a dedicated supporter of the St Marys Development Committee. Isobel is also very well known to many in our community, having worked in schools right up until she began treatment for oesophageal cancer. Isobel worked in the office at North St Marys and was the senior administration officer at St Clair Primary School until her illness. She was a life member of St Marys South P & C, which her children attended, and also ran cake stalls at Mamre House. Through her work on the Development Committee, Isobel played a very active role helping with publicity and the administration of the St Marys Spring festival and fun run for around 10 years. Last year at the Festival dinner, Isobel and her husband Neville celebrated their 51st wedding anniversary. Isobel’s death will be deeply felt by Neville, their four children and three grandchildren as well as so many in our community and our thoughts are with them. That the Mayoral Minute on The passing of Isobel Lowe be received. The Penrith City community, as they always do in time of crisis, banded together and helped each other with the severe storm event we experienced on the evening of Thursday 9 February. The hardest hit suburbs included Londonderry, Castlereagh, Cranebrook, Jamisontown and Kingswood and a number of residents suffered property damage and loss as a result of the severe storm. I commend the community for remaining calm in the face of rising waters. Throughout the evening and in the following days I received continuous updates on what was happening and the great work that our local SES and emergency services were doing in assisting the community. The event was in excess of a 1 in 100 year event. A once in a lifetime event, which saw as much as 120ml fall in a few hours in some parts of the City. That amount of rainfall would have had the same effect regardless of where it fell, whether it was Smithfield, Merrylands or Mosman. On Friday 10 February I spoke with the Premier and our local State and Federal members to ascertain how we could best assist those affected. Formal representations were made to the State Government to declare the event a natural disaster, which they have now done. This triggers financial assistance to those requiring it through the State and Federal Governments’ Natural Disaster Relief Funds. We will ensure that the community is made aware of the assistance this will provide. Some residents are also concerned about their eligibility for insurance cover from some companies and this is something I will also take up with our local members. · Emergency crews, who worked on that weekend and the following weeks to clean up and assist the community. · Organisation of special waste collections for debris and fencing and so forth were organised for that weekend and beyond. · Compassionate payment options for rates payment are available for eligible residents. · A letter of support from the Mayor to insurance companies will be written if required. · Investigating the organisation of a fundraising appeal to assist those most affected. Clearly the severity of the event and the consequences require a detailed investigation and I have requested the General Manager to report back to Council on this at the earliest opportunity. We will continue to work with our local communities in the cleanup of this event and I thank everyone involved for their assistance to date. That the Mayoral Minute on Community pulls together over severe storm event be received. This week I will be attending the 50th Anniversary celebration of Nepean Legacy, an event to acknowledge their 50 years of service to local families of Australian war veterans. Nepean Legacy was officially formed in 1962 to assist the families of men who had served in the world wars. Since then Nepean Legacy and the volunteers and staff who run the organisation have helped over 10,000 families in the local area. Currently, Nepean Legacy cares for around 600 families including relatives of people who have fought in Korea, Vietnam and Afghanistan. They offer advice on healthcare, government assistance, educational assistance and finance and legal issues. They also coordinate a number of events and programs throughout the year to raise money and further support widows and their children. The support of members and volunteers has been instrumental in the success and longevity of Nepean Legacy. In particular I’d like to acknowledge long serving member David Trist, who has served as a Legatee (member of Legacy) for the last 50 years. David has cared for a number of people in their time of need and his commitment to the organisation and to people affected by war should be commended. I’d like to congratulate Nepean Legacy on their 50 years of service and acknowledge their efforts to assist families affected by war in our local area. I’d like to also thank the members, volunteers and staff for their ongoing contribution to the organisation and to the community. That the Mayoral Minute on Nepean Legacy 50th Anniversary be received. Apologies were accepted from the Deputy Mayor, Councillor Jackie Greenow and Ruth Byrnes - Senior Traffic Officer. 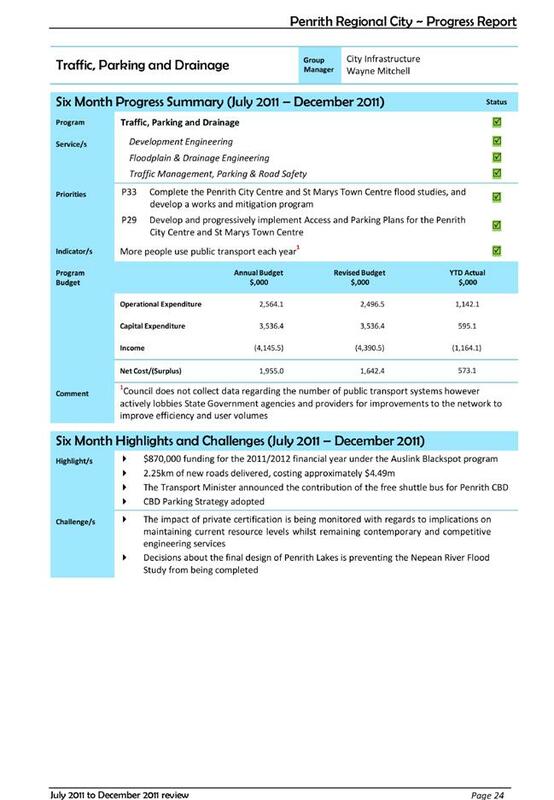 LTC 123 That a further report be brought to a future Council Meeting on this item including an audit of current and future parking needs in the area including shops at the Great Western Highway. 1. The information contained in the report on Roads & Maritime Services Delegations to Council be received. 2. The Local Traffic Committee and Council note the information. 1. The information contained in the report on Stafford Street, Kingswood - Proposed Provision of "No Stopping" Restrictions be received. 2. “No Stopping” restrictions be implemented for a distance of 10m from the kerb alignment in Parker Street on the northern side of Stafford Street, Kingswood, east of Parker Street, to reinforce the statutory restrictions. 3. The existing “No Stopping” sign located on the northern side of Stafford Street, Kingswood, 40m west of Somerset Street, be moved approximately 1m east. 1. The information contained in the report on Rochford Street, St Clair - Speeding Vehicles be received. 2. The project for mid-block traffic calming improvements in Rochford Street, St Clair be entered into Council’s Traffic Facility Prioritisation Program. When the project receives priority against other listed sites, Council’s Design Co-ordinator be requested to prepare a design for the location, with a further report submitted to the Local Traffic Committee for design plan consideration. 3. The resident be advised of Council’s resolution. 1. The information contained in the report on Castlereagh Road, Penrith - AAGPS "Head of the River" Event be received. 2. The Event Applicant be advised that this is a Class 2 Event under the “Guide to Traffic and Transport Management for Special Events” and that all conditions and requirements specified in the Guide must be complied with prior to the event. 3. The Traffic Management Plan submitted by Event Applicant detailing the proposed temporary road closures for the event to be held on Saturday 10 March 2012 be endorsed. 4. A Traffic Management Plan including a Risk Management Plan be lodged by the Event Applicant with the Roads and Maritime Services for concurrence, prior to the event. A copy of the Roads and Maritime Services’ concurrence must be submitted to Council prior to the event. 5. The Event Applicant obtain separate approval from the NSW Police and submit a Schedule 1 Form under the Summary Offences Act to the NSW Police prior to the event. A copy of the NSW Police approval must be submitted to Council prior to the event. 6. The Event Applicant submit to Council a copy of Public Liability Insurance (usually a Certificate of Currency) of minimum $10 million, prior to the event. In addition, the Event Applicant indemnify Council in writing against all claims for damage and injury which may result from the proposed event. 7. A detailed Traffic Control Plan shall be prepared by a qualified and certified professional and submitted to Council, the Roads and Maritime Services and NSW Police prior to the event should traffic management arrangements be put in place. 8. 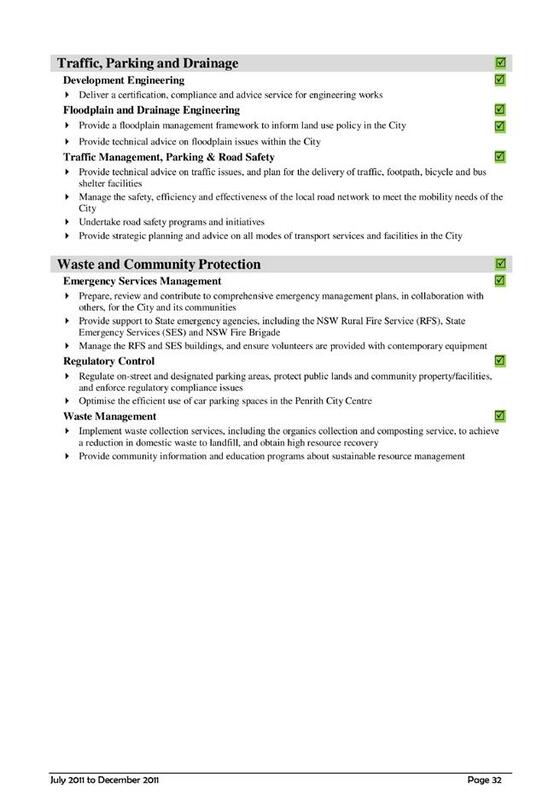 The Event Applicant arrange to place barricades and provide Roads and Maritime Services accredited Traffic Controllers where required by the endorsed Traffic Management Plan. Where the Traffic Management and Traffic Control Plans indicate, Traffic Controllers are to be used. All Traffic Controllers must have current Roads and Maritime Services certification. 9. The Event Applicant provide variable message signs (VMS) in appropriate locations as detailed in the Traffic Management Plan. VMS boards should be located in accordance with the Roads and Maritime Services Technical Direction TDT2010/07. 10. The event organiser notify ambulance and fire brigade (NSW Fire Brigade and RFS) and SES of the proposed event and submit a copy of the notification to Council prior to the event. 11. The Event Applicant notify private bus companies of the proposed event and submit a copy of the notification to Council prior to the event. Bus companies shall be requested to advertise the changed route for affected buses at least one week prior to, and during, the event. 12. Should the consultation process resolve to temporarily relocate bus stops or bus routes that were not indicated in the original Traffic Management Plan, a further report will be required to be submitted to the next available Local Traffic Committee meeting. 13. The Event Applicant shall ensure that noise control measures are in place as required by the protection of the Environment Operations (Noise Control) Regulation 2000. 14. All works as part of this approval are conducted at no cost to Council. 15. The applicant be advised of Council’s resolution. 16. Council reserves the right to cancel this approval at any time. 1. The information contained in the report on High Street, Penrith – Proposed Blister Island Treatment at Signalised Pedestrian Crossing fronting Penrith Public School be received. 2. Notification of the proposed works be forwarded to affected businesses and property owners. 3. Council’s Design Co-ordinator be requested to prepare a design plan of the proposed facility, with a further report submitted to the Local Traffic Committee for design plan finalisation and endorsement. 4. 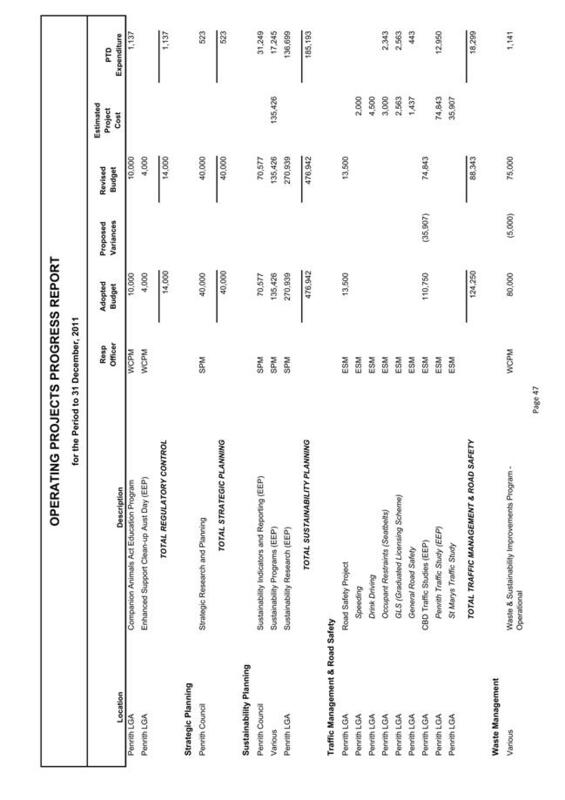 Costs associated with the design and construction of kerb blisters and associated linemarking be funded from the 2011/2012 Urgent Local Traffic Committee Facilities budget. 5. The Penrith Public School Principal and the Roads and Maritime Services be advised of Council’s resolution. 1. 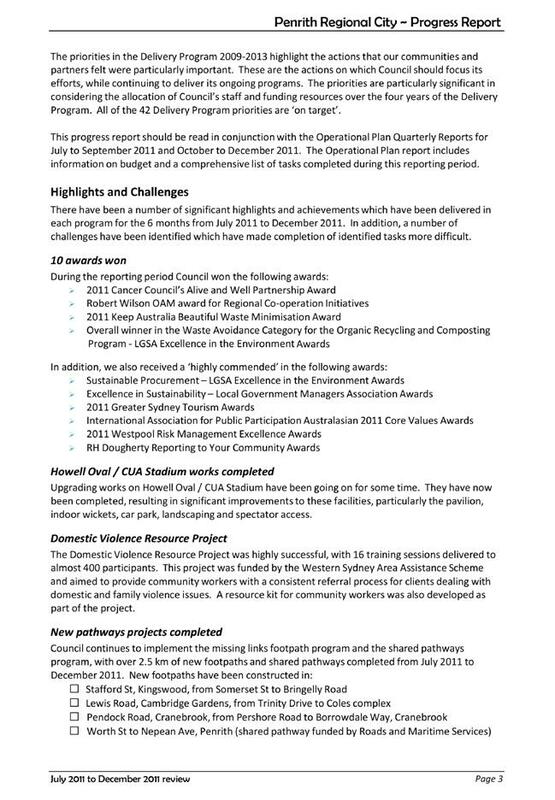 The information contained in the report on Brisbane Street, Oxley Park - Proposed Traffic Calming Devices be received. 2. Community consultation be conducted with affected residents regarding loss of parking associated with the facilities, and any substantial objections be referred back to the Local Traffic Committee. 3. Subject to no substantial objections, Design Plan AB 166 for installation of three Watts Profile speed humps be finalised and endorsed for construction. A further three submissions were received from residents regarding the provision of a “No Right Turn” restriction. Two of these submissions were in support of the proposal, and one was opposed to the proposal. The submission opposing the right-turn ban raised concerns regarding delays that would be caused at Worth Street and High Street, comments that the intersection is not dangerous and a refuge is not needed, and other comments regarding the need for a cycleway and that the project is a waste of money. These concerns have been addressed in the report and are similar to matters raised in previous submissions by another resident. 1. The information contained in the report on Union Road, Penrith - Proposed Provision of "No Right Turn" Restriction at Mulgoa Road, Penrith be received. 2. The proposed “No Right Turn” restriction in Union Road, at the intersection of Mulgoa Road, Penrith be endorsed, subject to no further substantial objections being received. 3. A Traffic Management Plan for the proposed “No Right Turn” restriction in Union Road, at the intersection of Mulgoa Road, Penrith be referred to the Roads and Maritime Services for determination. 4. Those people who made submissions regarding the proposal be advised of Council’s resolution. 5. The Design Plan No. AM176, Issue A, dated 22/12/11 for the pedestrian refuge be endorsed for construction, subject to approval of the Traffic Management Plan by the Roads and Maritime Services. 6. 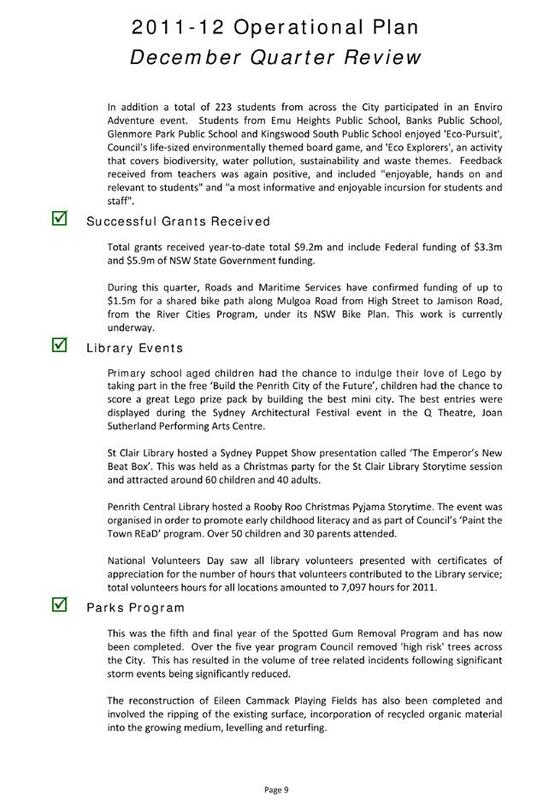 Funding for the works be through Council and the Roads and Maritime Services in accordance with the funding agreement for the NSW Bike Plan (2011/2012) (DT05202). 1. 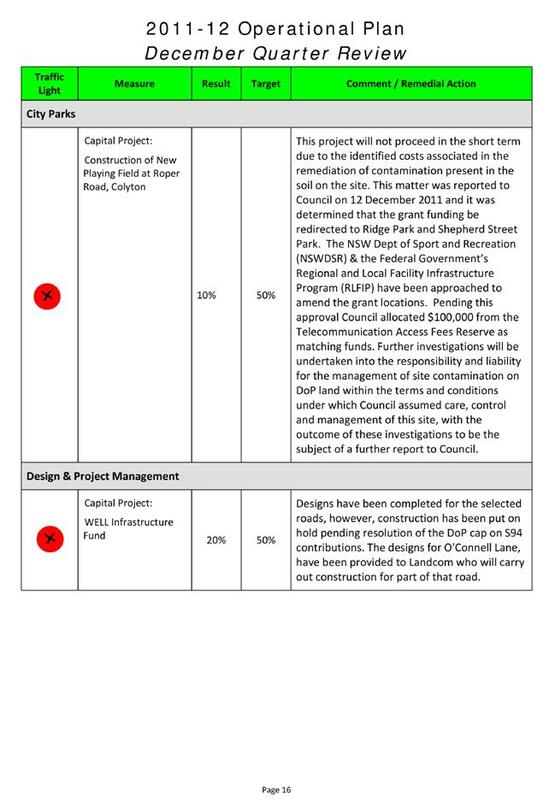 The information contained in the report on Mulgoa Rise Stage 1A - Endorsement of Signs & Linemarking Plans be received. 2. The signage and linemarking plan prepared by J Wyndham Prince for Mulgoa Rise Stage 1A, Plan No. 8983/CC105, be endorsed. 3. J Wyndham Prince be advised of Council’s resolution. 1. The information contained in the report on Derby Street & Colless Street, Penrith - Proposed Pedestrian Refuge Island be received. 3. Subject to no substantial objections, Design Plan AD 127 for installation of a pedestrian refuge facility be finalised and endorsed for construction. The Committee noted that Council officers had previously written to the Roads and Maritime Services requesting their consideration of providing a pedestrian refuge on Belmore Street at the same intersection, as Belmore Street is a State Road under the control and management of the Roads and Maritime Services. It was also noted that a response had not been received from the RMS regarding this request. 1. The information contained in the report on Lawson Street & Belmore Street, Penrith - Proposed Pedestrian Refuge Island be received. 2. Design Plan AL 139 for installation of a pedestrian refuge facility on Lawson Street at Belmore Street, Penrith be finalised and endorsed for construction. 3. Council write to the Roads and Maritime Services and request an update on the progress of investigations into the provision of a pedestrian refuge on Belmore Street, Penrith. 1. The information contained in the report on Peachtree Road, Penrith - Proposed Provision of "No Stopping" & "No Parking" Restrictions be received. 2. Full-time “No Stopping” restrictions be implemented on the southern side of Peachtree Road, Penrith for a distance of 20m from its intersection with Castlereagh Road, and full-time “No Parking” restrictions be implemented beyond this point for the length of the site’s frontage to Peachtree Road, in accordance with plan A004 A dated January 2012 as amended in red. 3. All works be undertaken at no cost to Council. 4. The applicant be advised of Council’s resolution. The Local Traffic Committee, at its meeting of 5 December 2011, considered a report on “Glossop Street, St Marys – Request for Parking Restrictions”. At its Ordinary Meeting on 12 December 2011, Council resolved (in part), on the recommendation of the Committee, “that ‘No Stopping’ restrictions be implemented on Glossop Street, St Marys in the northbound lane between King Street and Phillip Street”. A “Bus Stop” in the northbound lane, near 151-153 Glossop Street, has been located during the implementation of the restrictions. Council’s records do not indicate whether this location is an approved “Bus Stop” and, in addition, the stop is not listed on Council’s Transit Stop Register. Westbus has advised, however, that the “Bus Stop” is in service by the 774 route and they have requested it be retained and not rescinded. To reinforce this “Bus Stop” within the “No Stopping” zone, it is recommended that a “Bus Zone” be implemented for 20m. It is unclear if the change from “Bus Stop” to “Bus Zone” triggers the upgrade of the stop to full Disability Discrimination Act 1992 (DDA) compliance. Council has previously written to Transport for NSW (formerly the Department of Transport) regarding a similar situation and will again write to Transport for NSW to confirm the requirements for this situation. In addition, Transport for NSW will be requested to provide advice with regard to responsibilities for providing infrastructure to comply with the DDA if required. 1. The existing “Bus Stop” near 151 Glossop Street, St Marys be signposted and formalised as a 20m “Bus Zone”. 2. Transport for NSW be advised of Council’s resolution and be requested to provide advice with regard to responsibilities for providing Disability Discrimination Act 1992 compliant infrastructure at the new “Bus Zone”. Council’s Road Network Services Engineer circulated a design plan to the Committee to consider a request from Landcom for endorsement of plans for the provision of a new roundabout on Coreen Avenue, Penrith, for access into the new residential development off Coreen Avenue, known as North Penrith. The Committee was advised that the proposed roundabout is the main access into the new development and was endorsed through the strategic planning for the residential estate. Council officers had investigated other options into intersection controls at the location, however a roundabout is the preferred option. Advice from Council’s Development Engineers is that the roundabout complies with numerical standards set out in Austroads and that a Stage 3 Road Safety Audit had been conducted. 1. Deflection for westbound vehicles should be assessed with the view of reducing the deflection. These concerns were raised in respect of the efficiency of the intersection, in particular, due to the use of heavy vehicles at the intersection and the perceived likelihood of a vehicle leaving the road and crashing into the property on the corner. It was noted that the deflection provided was approximately the maximum desirable in Austroads, however this deflection may not be suitable for the roundabout at this location. 2. Deflection for eastbound vehicles appears minimal. A consistent approach to deflection for each direction needs to be addressed and considered. 3. Safe intersection sight distance needs to be addressed for vehicles in the new road. Sight lines cannot run through private land. 4. Pedestrian connectivity for Coreen Avenue has not been catered for in the form of a refuge in the median islands. The Committee requires further information regarding pedestrian desire lines and required facilities. 5. The setback of the pedestrian refuge in the new road requires a significant pedestrian detour. This may trigger the need for pedestrian fencing to stop pedestrians crossing mid-intersection. Further, crossing sight distance needs to be compliant. 6. Other issues, such as non-compliant signage and linemarking and heavy vehicle detours, need to be addressed and amended. That the provision of a roundabout on Coreen Avenue, Penrith, for access into the North Penrith Army Land development, be supported in principle, subject to the developer being required to investigate the concerns raised by the Local Traffic Committee and a further plan being prepared by the applicant and referred back to the Committee for endorsement prior to any approvals being granted for the works. The Westbus representative advised that from Monday, 6 February 2012, Westbus will no longer operate bus services via Second Avenue and O’Connell Street, Kingswood. “Due to safety concerns when buses are turning Left from Second avenue in to O’Connell Street at Kingswood, all 774, 775 and 776 services will be diverted commencing Monday 6th February 2012. The Committee requested further advice from the Westbus representative regarding reasons for diverting services that were not affected by the left-turn. The Westbus representative was also requested to advise what had prompted the discussions. The Westbus representative advised that all services were diverted to maintain a consistent route, despite the St Marys to Penrith service not being required to turn left at the subject intersection. The diversion was prompted by buses reportedly hitting the barriers causing damage to buses, despite many buses being able to make the turn without hitting the barriers. There being no further business the Chairperson declared the meeting closed, the time being 10:45am. That the recommendations contained in the Report and Recommendations of the Local Traffic Committee meeting held on 6 February, 2012 be adopted. Apologies were received for Councillors Robert Ardill, Tanya Davies, Ben Goldfinch and Kaylene Allison. The minutes of the Policy Review Committee Meeting of 5 December 2011 were confirmed. 1. The information contained in the report on Billington Place Car Park, Emu Plains - Request for Provision of 2-Hour Parking Restrictions be received. 2. Council prepare a detailed submission to Transport for NSW seeking their urgent review and reconsideration of our request for the allocation of 61 (2P) parking spaces in Billington Place, Emu Plains. 5. Council investigates the implementation of a park in marked bay scheme along the length of Railway Row. That the recommendations contained in the Report and Recommendations of the Policy Review Committee meeting held on 13 February, 2012 be adopted. 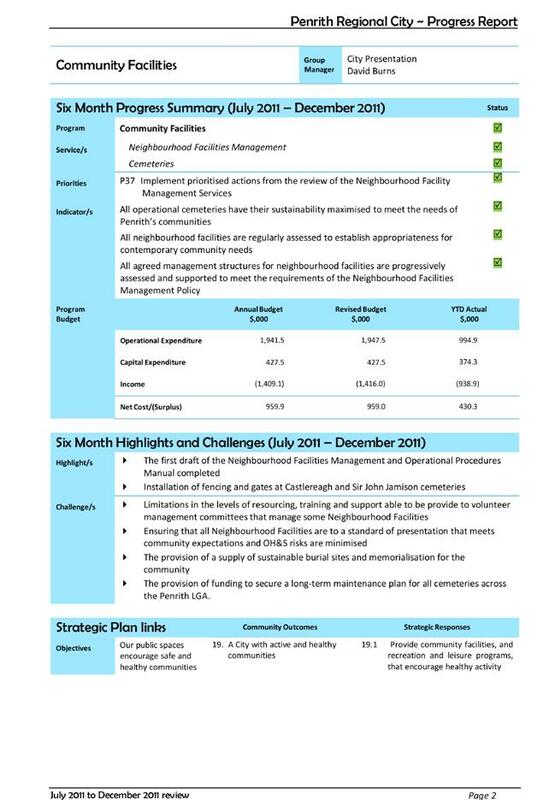 This report is presented by the General Manager, and outlines Council’s progress towards implementing its four-year Delivery Program for the six month period of July 2011 to December 2011. 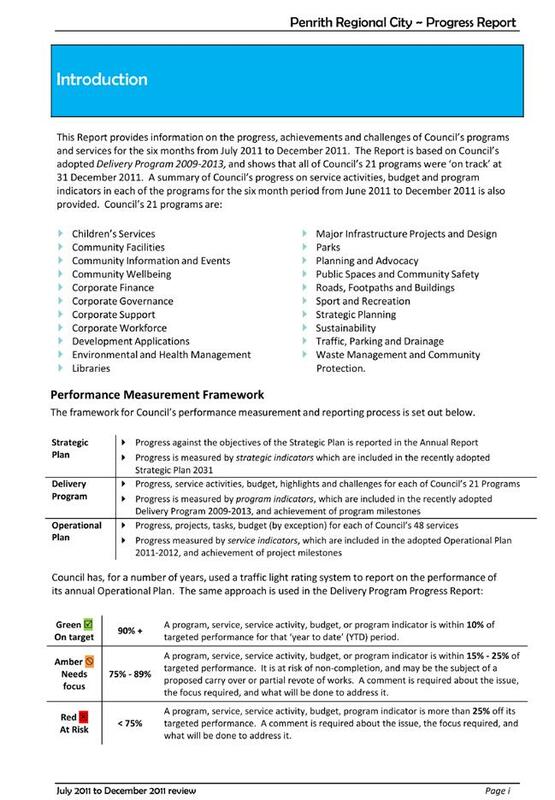 The report and accompanying Delivery Program Progress Report (attached) detail the progress of Council’s 21 programs, including a summary of key program highlights and challenges. 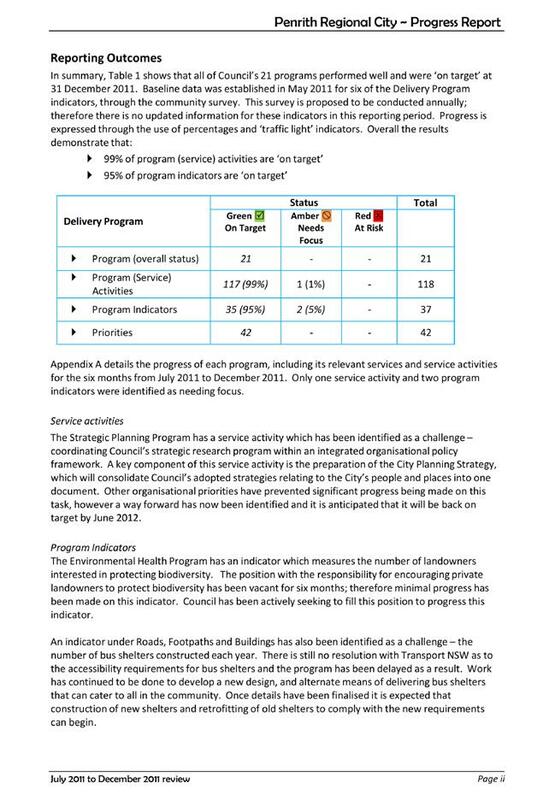 The Delivery Program Progress Report shows that all of Council’s 21 programs were ‘on track’ on 31 December 2011. Of the 37 Delivery Program indicators, 35 are ‘on track’ and 2 indicators ‘need focus’. · Progress on longer term housing supply projects including Penrith Lakes, North Penrith, Glenmore Park Stage 2 and Jordan Springs. 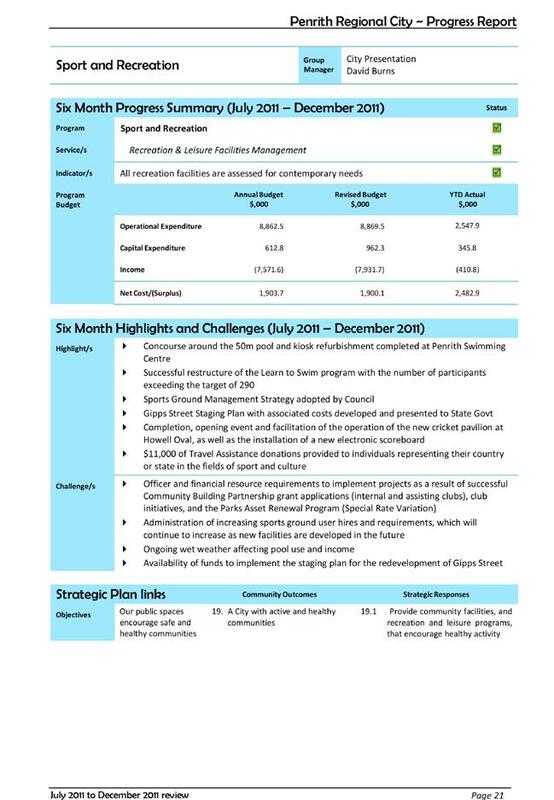 This report should be read in conjunction with the Operational Plan Quarterly Report for October to December 2011 which includes detailed information on budget and a comprehensive list of tasks completed during this reporting period. 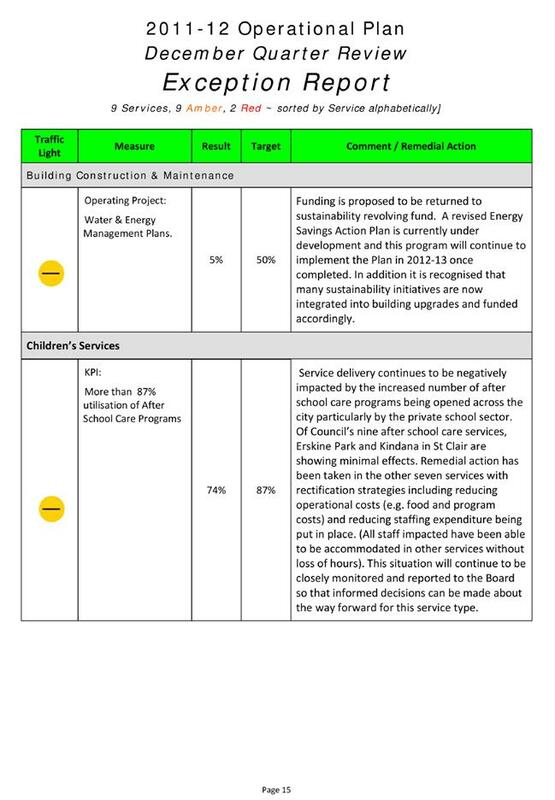 This report recommends that the Delivery Program Progress Report (enclosed and forwarded separately to Councillors) is received. The Integrated Planning and Reporting (IPR) Legislation requires the General Manager to report Council’s progress on the Delivery Program every six months. 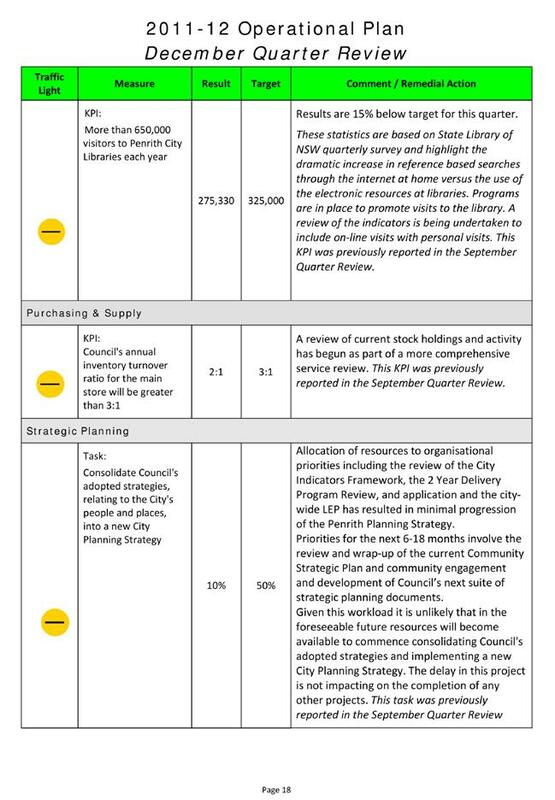 The Delivery Program must address the full range of Council’s operations, specifically outlining the principal activities Council will undertake over that four year period in response to the outcomes identified in the Community Strategic Plan. This Progress Report is the fifth in a series of eight that charts the organisations progress in implementing the Delivery Program 2009-2013. This report focuses on the six months from July-December 2011. · 95% of program indicators are ‘on target’. 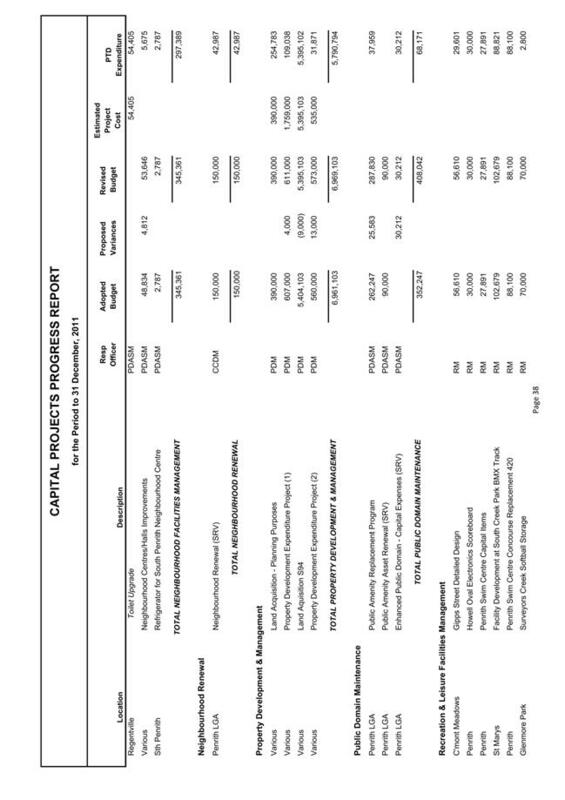 A summary of Council’s progress against the programs, indicators and priorities is presented in the table below. 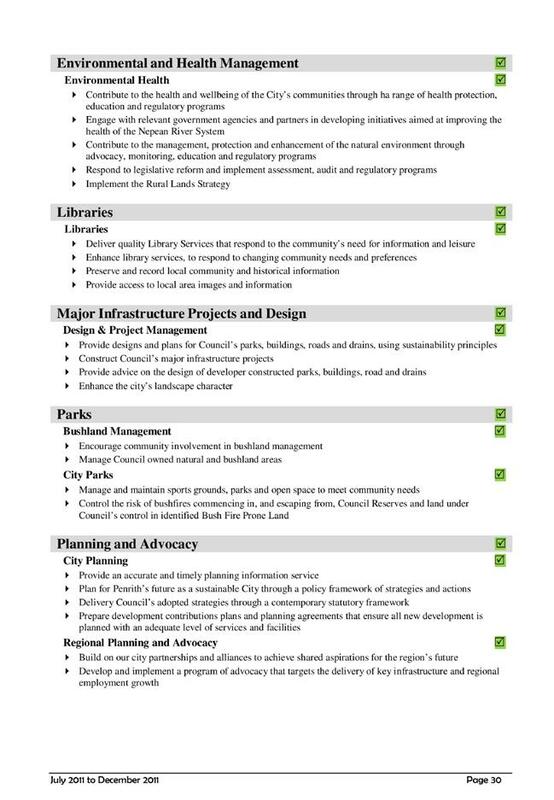 The priorities in the Delivery Program 2009-2013 highlight the actions that our communities and partners felt were particularly important. 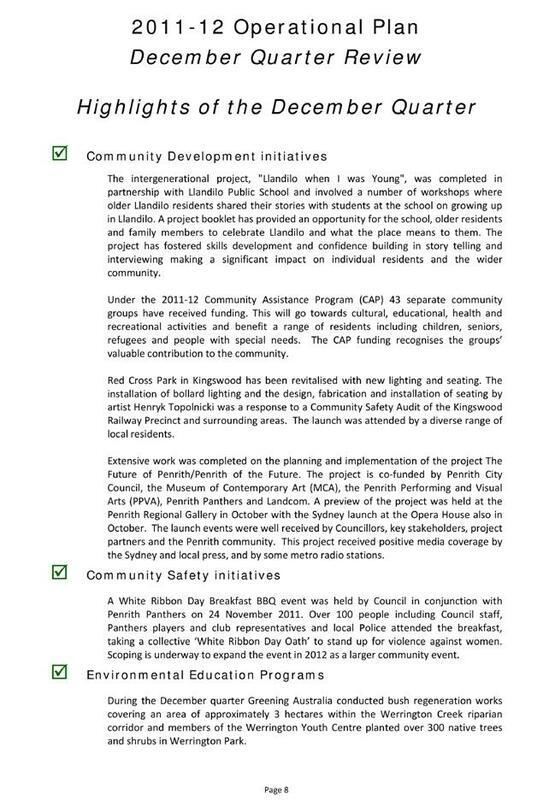 These are the actions on which Council should focus its efforts, while continuing to deliver its ongoing programs. The priorities are particularly significant in considering the allocation of Council’s staff and funding resources over the four years of the Delivery Program. All of the 42 Delivery Program priorities are ‘on target’. 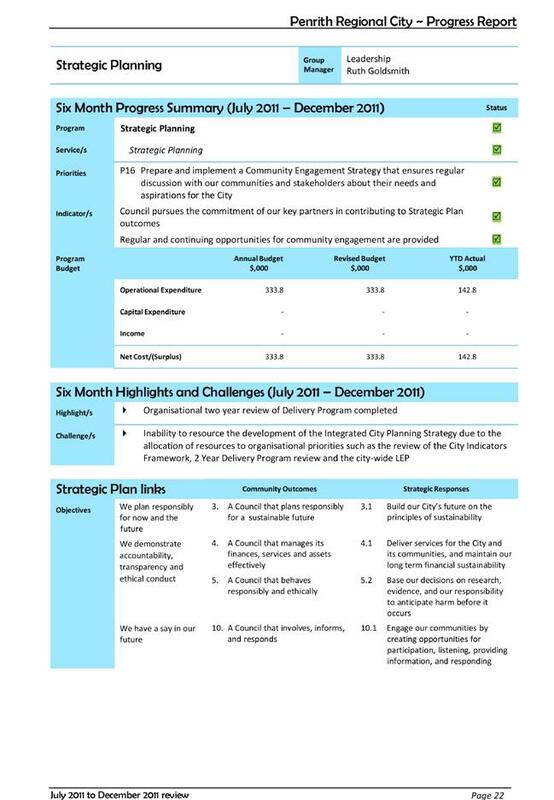 One service activity has been identified as a challenge, in the Strategic Planning Program – ‘coordinating Council’s strategic research program within an integrated organisational policy framework’. 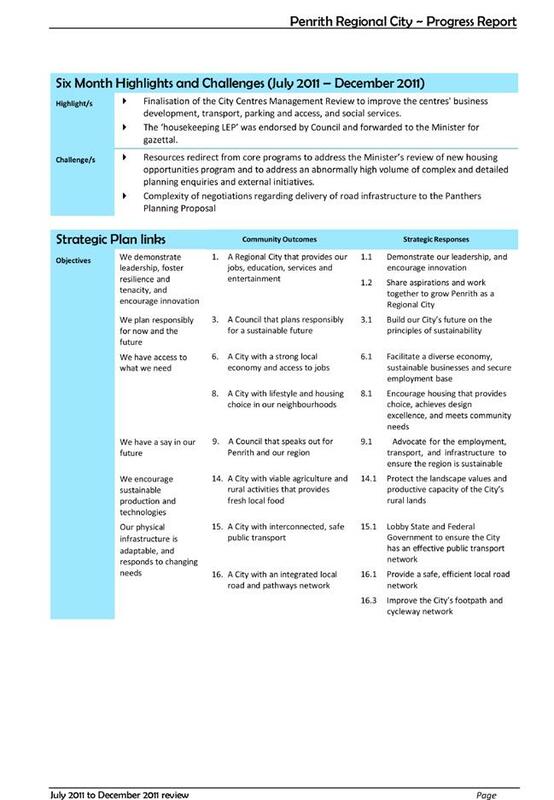 A key component of this service activity is the preparation of the City Planning Strategy, which will consolidate Council’s adopted strategies relating to the City’s people and places into one document. Other organisational priorities have prevented significant progress being made on this task, however a way forward has now been identified and it is anticipated that it will be back on target by June 2012. Two program indicators are currently identified as ‘challenges’. The first indicator sits within the Environmental Health Program. The staff position with the responsibility for encouraging private landowners to protect biodiversity has been vacant for six months; therefore minimal progress has been made on the indicator which measures the number of landowners interested in protecting biodiversity. 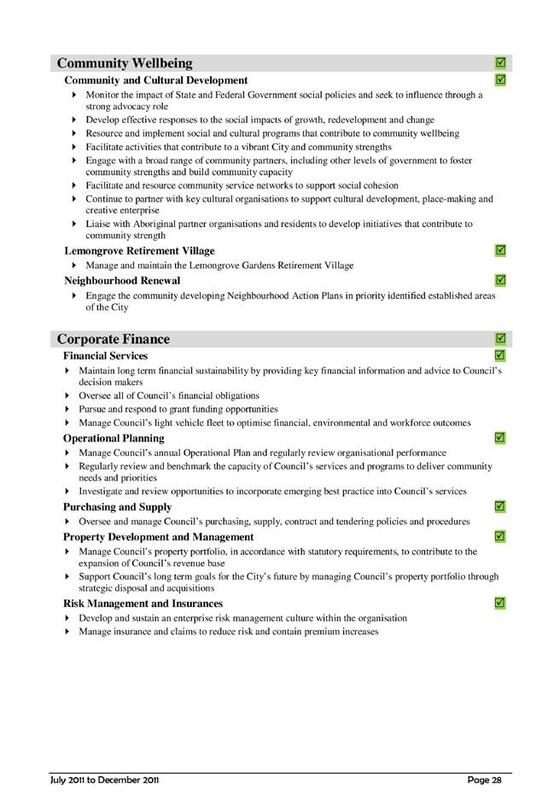 Council has been actively seeking to fill this position, to enable progress with this indicator. An indicator under Roads, Footpaths and Buildings has also been identified as a challenge – the number of bus shelters constructed each year. There is still no resolution with Transport for NSW as to the accessibility requirements for bus shelters and the program has been delayed as a result. Work has continued to be done to develop a new design, and alternate means of delivering bus shelters that can cater to all in the community. Once details have been finalised it is expected that construction of new shelters and retrofitting of old shelters to comply with the new requirements can begin. 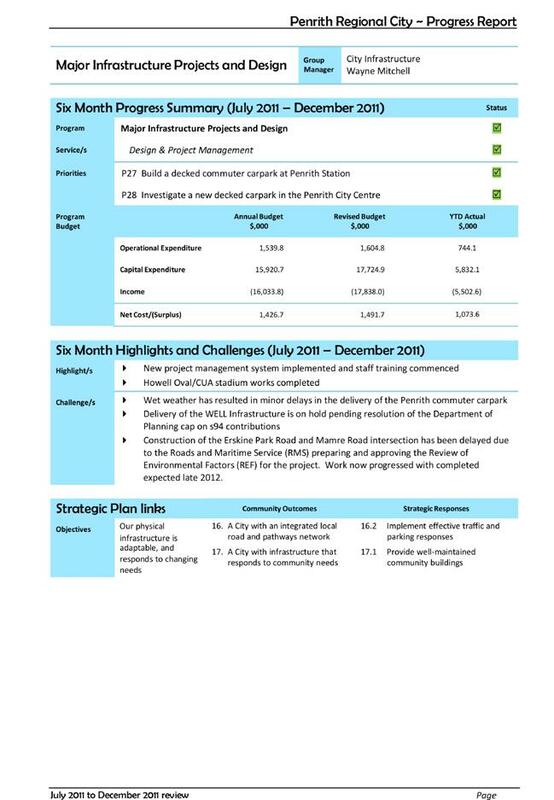 More detailed information is included in the attached progress report, which should be read in conjunction with the Operational Plan Quarterly Report for October to December 2011. 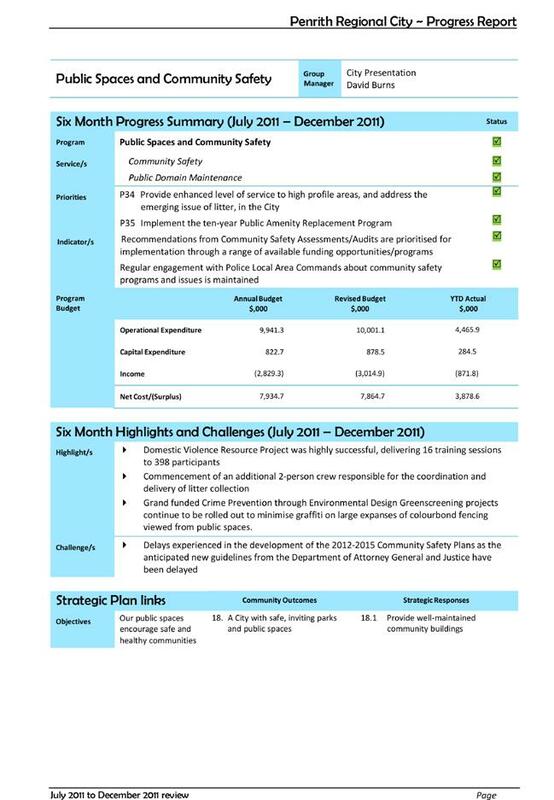 The Operational Plan report includes information on the progress of individual service activities and tasks, detailed information on budget and a comprehensive list of tasks completed over the reporting period. A number of projects have been completed or reached significant milestones over the reporting period. These are summarised below. 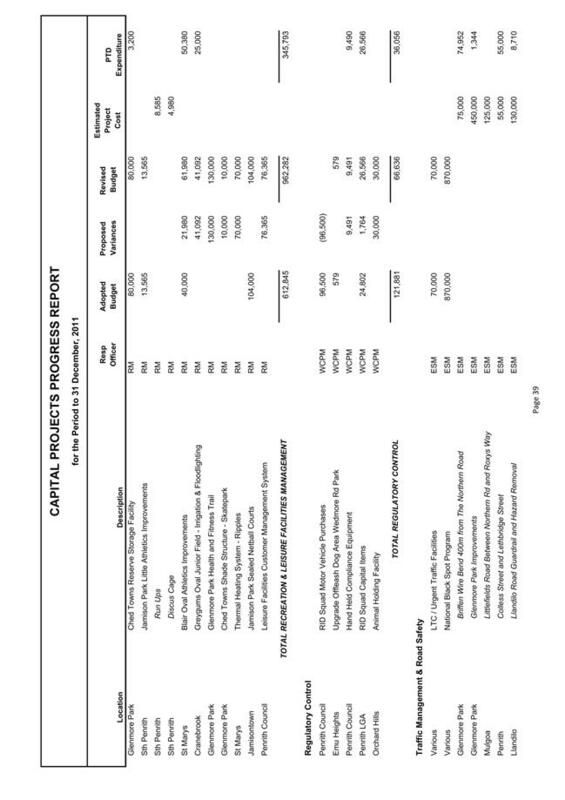 More detailed information is included in the attached Progress Report. · Overall winner in the Waste Avoidance Category for the Organic Recycling and Composting Program - LGSA Excellence in the Environment Awards. In addition, we also received a ‘highly commended’ in six other awards, ranging from tourism to risk management. Upgrading works on Howell Oval / CUA Stadium have now been completed, resulting in significant improvements to these facilities, particularly the pavilion, indoor wickets, car park, landscaping and spectator access. The Domestic Violence Resource Project was highly successful, with 16 training sessions delivered to almost 400 participants. This project was funded by the Western Sydney Area Assistance Scheme and aimed to provide community workers with a consistent referral process for clients dealing with domestic and family violence issues. A resource kit for community workers was also developed as part of the project. Council continues to implement the missing links footpath program and the shared pathways program, with over 2.5 km of new footpaths and shared pathways completed from July 2011 to December 2011. New footpaths have been constructed in Stafford St, Kingswood; Lewis Rd, Cambridge Gardens and Pendock Road, Cranebrook. A shared pathway funded by Roads and Maritime Services has also been constructed from Worth St to Nepean Avenue, Penrith. These upgrades increase the utility of these facilities, and are part of a continuing program of sports field upgrades. Council set a target of 58% of waste being diverted from landfill, as part of our ongoing campaign to reduce waste to landfill and so increase resource recovery. This was exceeded during the reporting period, with 65% of waste collected by Council diverted from landfill. Not only is this a significant achievement in terms of sustainability and resource recovery, but it also represents a significant cost saving. 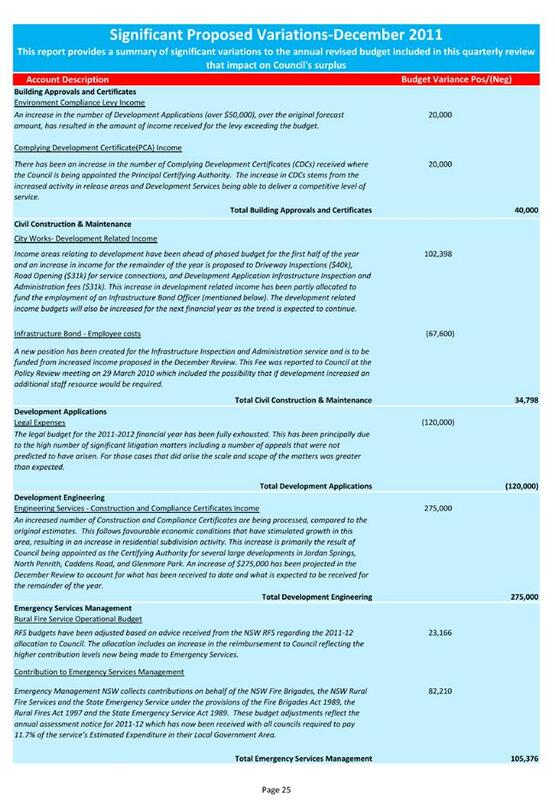 A total of 218 Construction Certificates were approved, representing a value of $28 million, as well as almost 700 Development Applications representing a value in excess of $225 million. These approvals include 1,140 new residential lots across three new release areas – Caddens, Waterside and Jordan Springs – as well as two new employment developments at Erskine Park and a new bowling alley in Batt St, Penrith. The highlights summarised above represent key achievements in the reporting period, however progress has also been made on several longer term projects. Council has been involved in planning for the former Defence site in North Penrith for many years, attempting to negotiate an outcome which provides a mix of housing and employment opportunities. This planning has finally come to fruition with the approval of a concept plan for a range of housing styles, retail and community facilities and ancillary infrastructure. The site will accommodate up to 1,000 dwellings and a commercial centre including retail, commercial and light industrial floor space. The State Government has approved initial site works as a major project, and Council has approved the construction of 19 dwellings for a mix of housing types. In November the State Government invited owners of larger land holdings to make a submission direct to the Minister for Planning about the suitability of their land for residential development. Council was given the opportunity to respond to the submissions, and a major analysis of the Penrith and Western Sydney housing supply trends and other factors was commenced. Construction has been completed on the first homes in both Jordan Springs and the second stage of Glenmore Park. Residents are now moving in, and as construction continues these communities will grow. 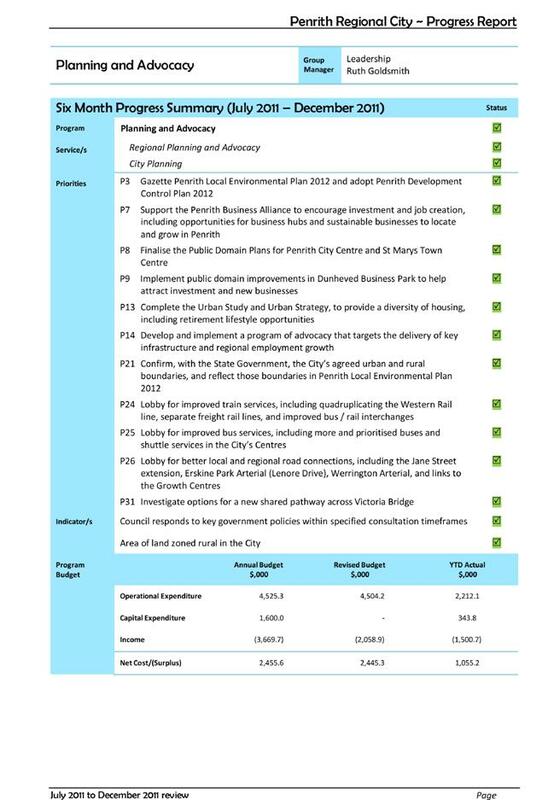 Council was also a partner in the ‘Future of Penrith – Penrith of the Future’ process, which has been recognised as an innovative approach to defining the future of a City, and generated a high level of interest from other organisations, including State Government, and the local and Sydney media. Implementation of the outcomes of this process will follow in the coming months. Council has undertaken a review of the management of the City Centre and St Marys Town Centre. This review has resulted in a successful outcome, with Council approving a new contemporary management model for both these bodies. Council has faced a number of challenges over the past six months, internally and externally. One of the significant challenges has been the weather with the six months from July to December recording 123.6 mm more rainfall than the average for that period. This has had a significant impact on Council’s ability to carry out the Parks Asset Renewal Program and general maintenance such as mowing. Rain is also putting at risk the completion by the end of the year of some capital projects in Roads, Footpaths and Buildings. As January 2012 has continued to be wetter than average, it is almost inevitable that some renewal works will be delayed into the next financial year. 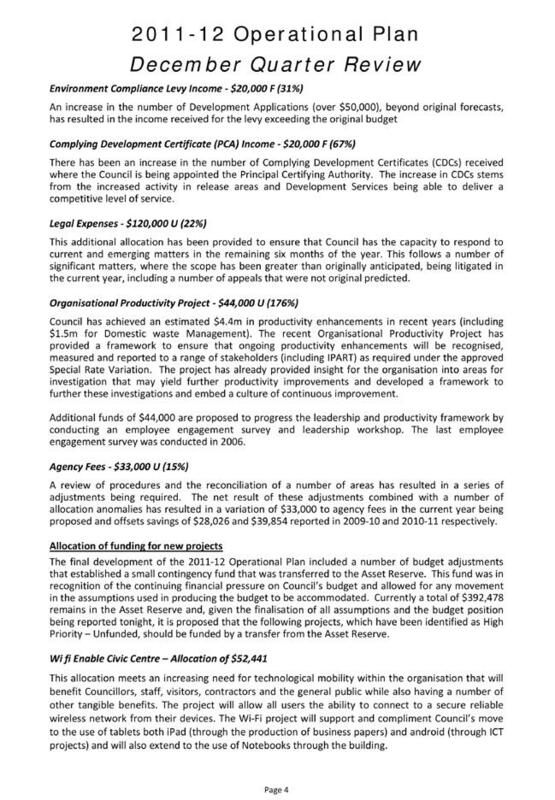 Council has also been impacted by the actions of State Government Departments, particularly the progression of the City-wide Plan, restriction on funding for works in the WELL precinct due to the cap on section 94 contributions and a delay in the issue of Community Safety Plan Guidelines. 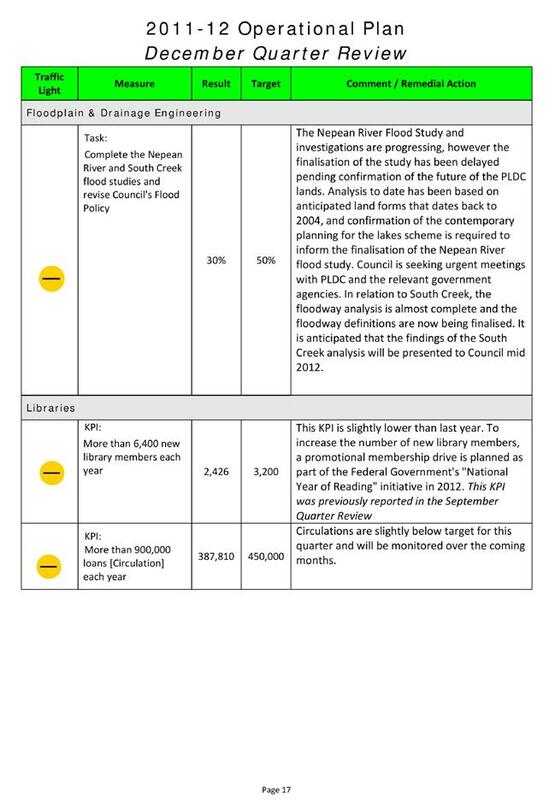 Also, a delay in the decision on the final landform of Penrith Lakes is preventing the Nepean River Flood Study from being completed. These issues will continue to be negotiated with the relevant government departments. 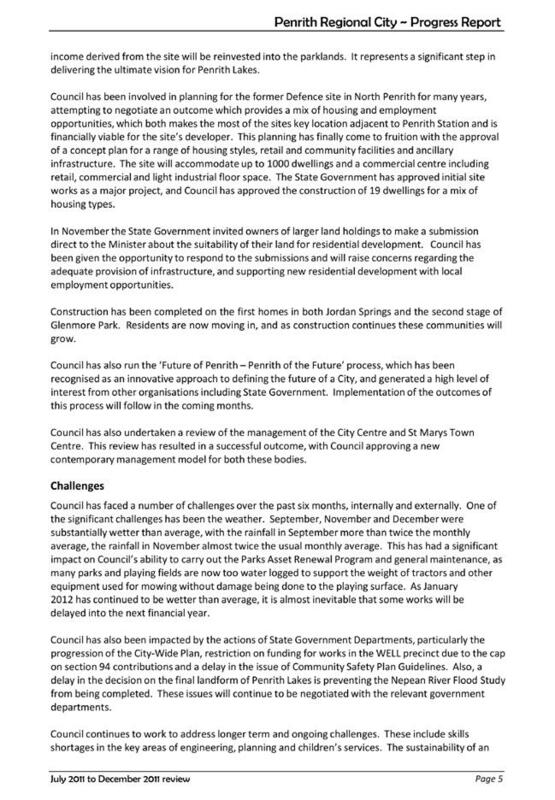 Council also continues to work to address longer term and ongoing challenges. These include skills shortages in the key areas of engineering, planning and children’s services. The sustainability of an ageing workforce is also an ongoing issue, particularly determining how to ensure that the experience and knowledge of our longer term employees is not lost as they approach retirement. Council must also continue to resource the implications of legislation and regulatory changes introduced by the State Government. Unplanned issues have emerged but the organisation has been responsive to these. Responding to the State Government’s tight timeframes for submissions to the review of potential, new housing precincts is an example. Overall, Council is in a good position coming into the last 18 months of the current Delivery Program. All Programs are on track, as are all the identified priorities. We have achieved a number of significant highlights in the past six months, as well as making progress on some longer term projects and issues. Council is experiencing some challenges in delivering its services, but generally these can be addressed. 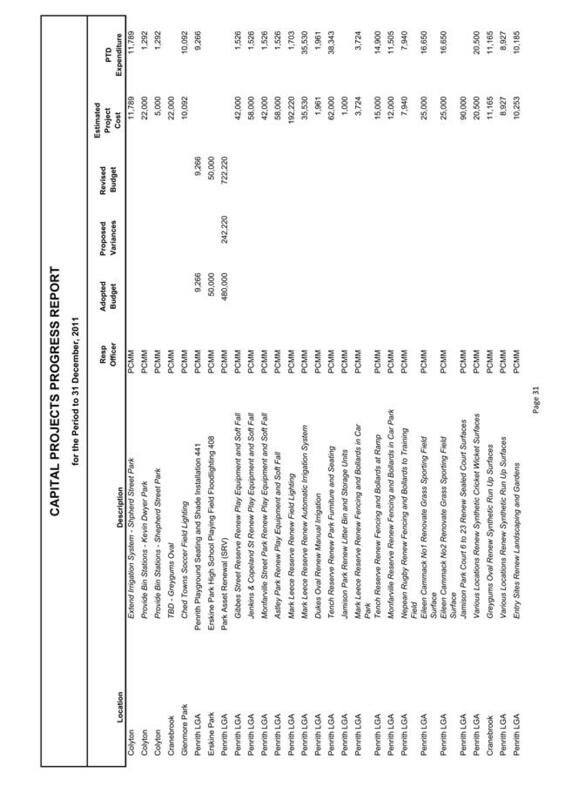 The next Progress Report will cover the period January to June 2012, and will be reported to Council in August, 2012. In accordance with the Local Government Act 1993 and the Integrated Planning and Reporting guidelines, Council must prepare a report on the progress of the service activities and tasks in the Operational Plan every 3 months. 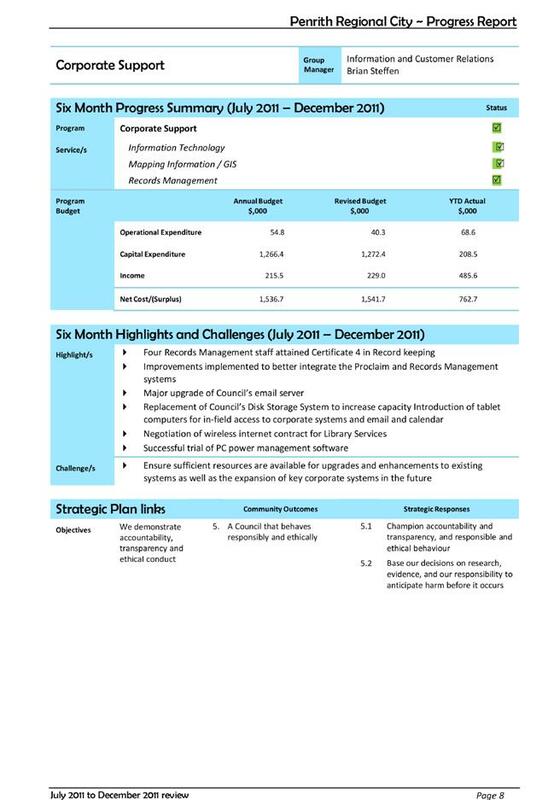 This review reports on the performance of external and internal services (with the exception of the three controlled entities which have separate reporting requirements) outlined in the 2011-12 Operational Plan. 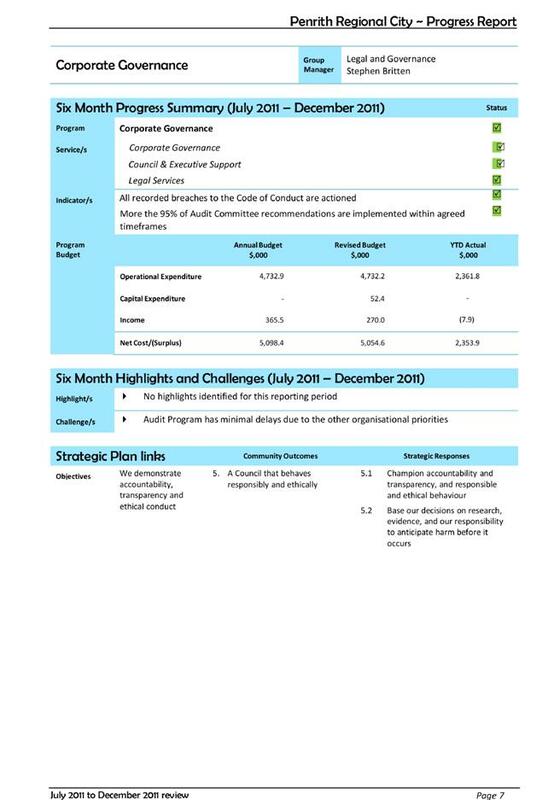 The December Quarter Review covers the second 3 months progress of the 2011-12 Operational Plan. 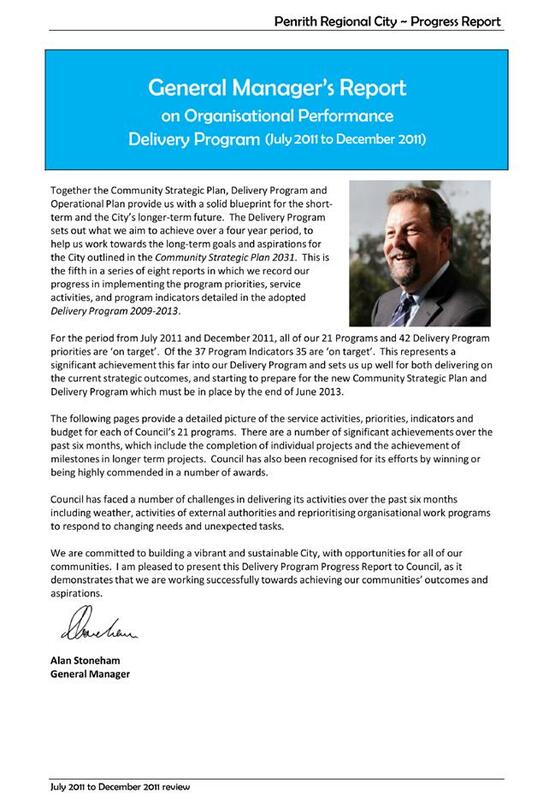 It also forms part of the first six month instalment of year 3 of the Council’s (4 Year) Delivery Program 2009-2013. Progress of the Delivery Program is the subject of another report to tonight’s meeting. 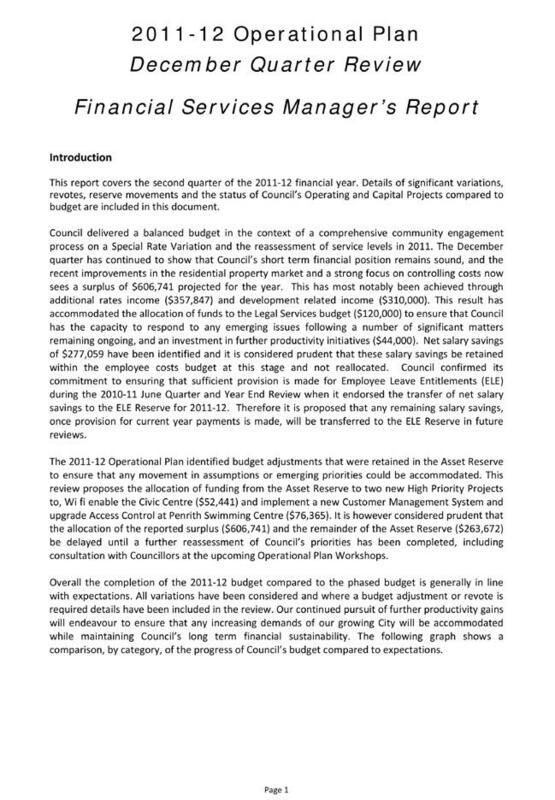 Section 1: December Quarter Review of the 2011-12 Operational Plan covering the performance summary of Council’s 44 services, completed tasks and projects and exception reporting. 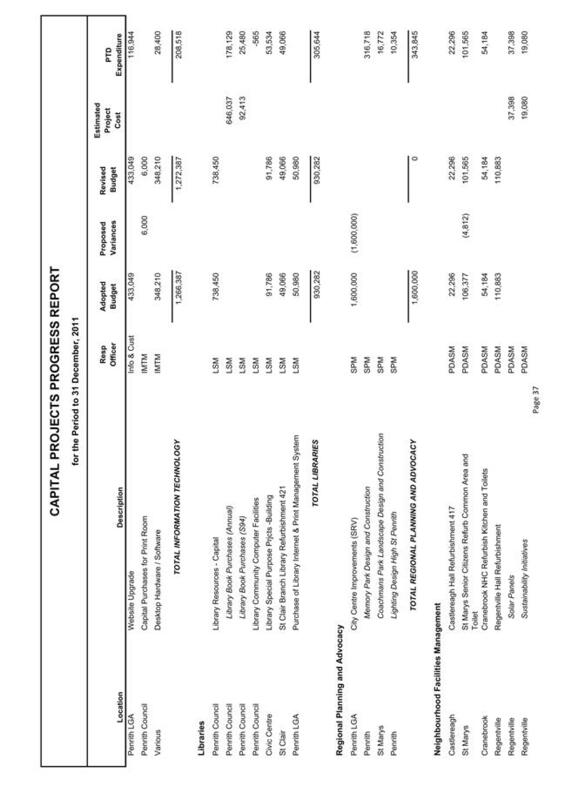 Section 2: A review of Council’s Financial Position as at 31 December 2011 including revised estimates identified in the recommended budget. A brief executive summary of the results in each area is provided below. 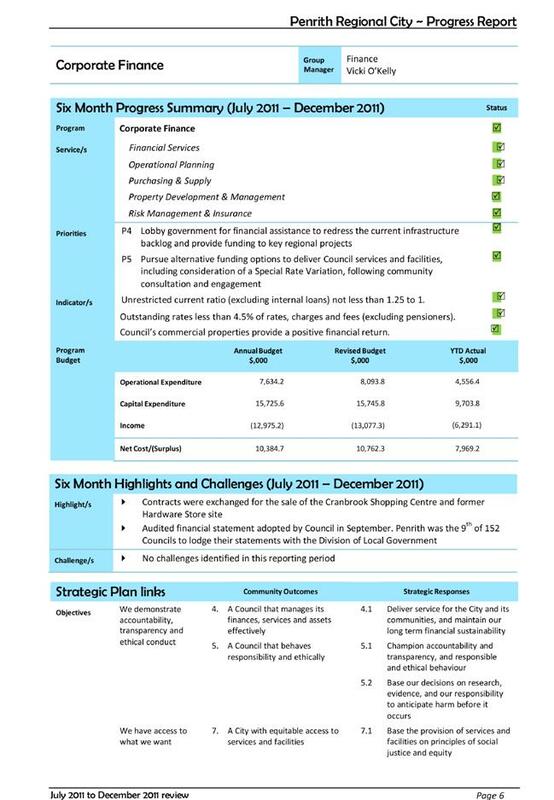 Attachment 1 – 2011-12 Operational Plan, Services Performance and Financial Review Summary, provides detailed information on all two sections mentioned above, and is also available on Council’s website. 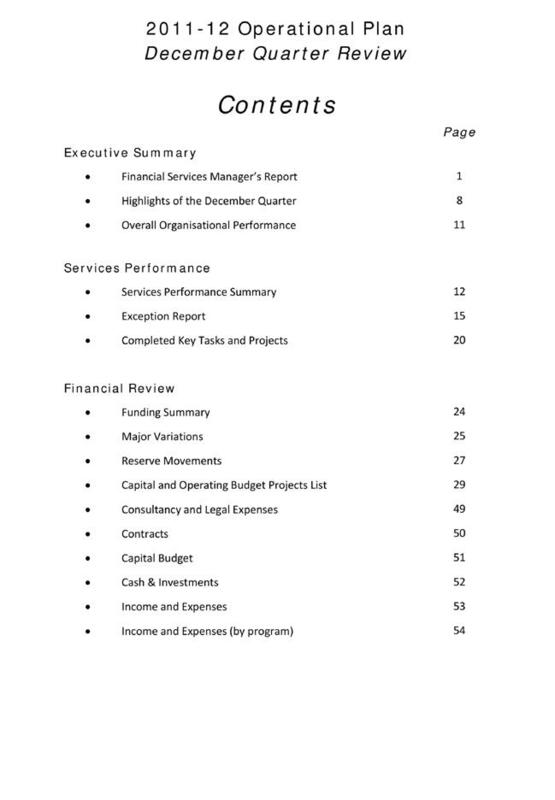 Councillors will receive a copy of the Services Performance and Financial Review Summary report under separate cover as an enclosure to this Business Paper. 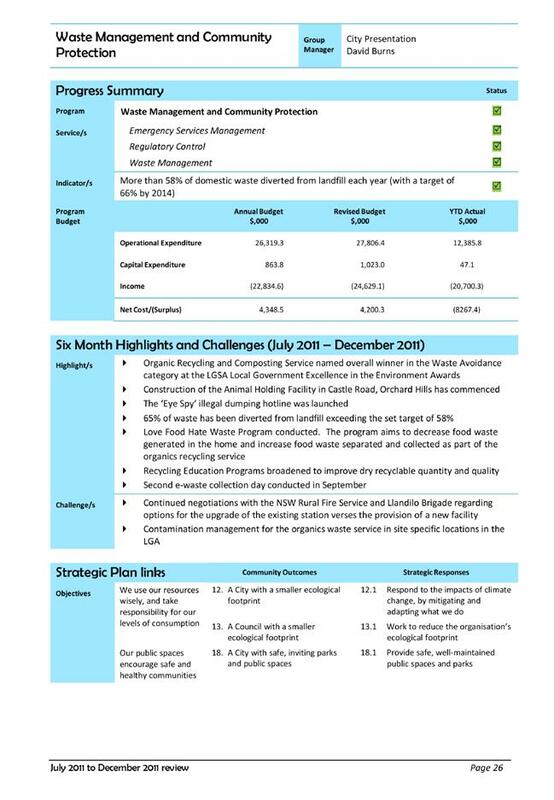 The combined effort of Council’s 44 services for the period ending 31 December 2011 has resulted in a 51.3% achievement of the yearly requirement as required in the adopted 2011-12 Operational Plan. This result demonstrated that Council is ‘on target’ at this stage of the year. 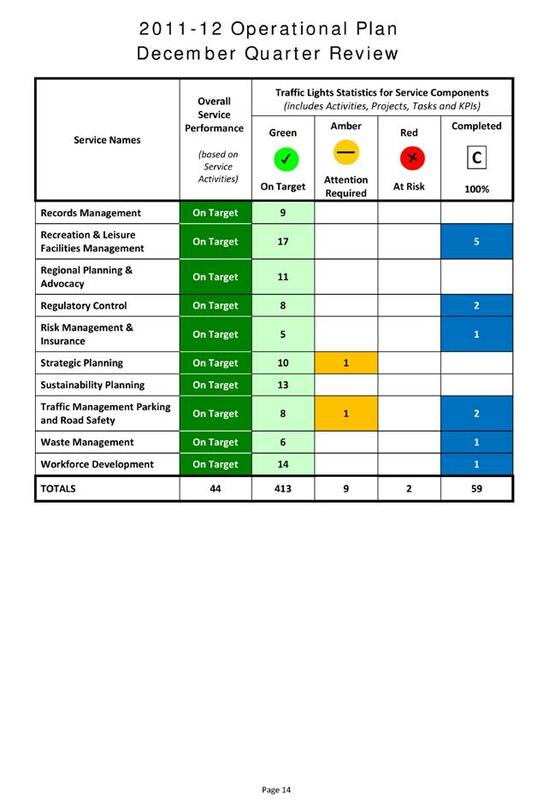 This assessment of year to date achievement is based upon Council’s Performance Planning System which calculates performance against 116 Service Activities. 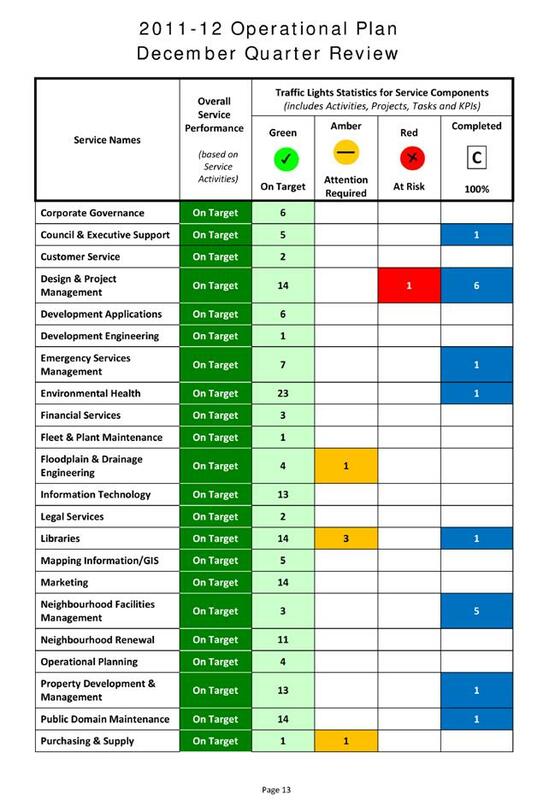 The system also provides exception reporting indicating that 157 Tasks, 95 Key Performance Indicators (KPIs) and 220 Capital and Operating Projects were either ‘on target’ or ‘completed’ by 31 December 2011. 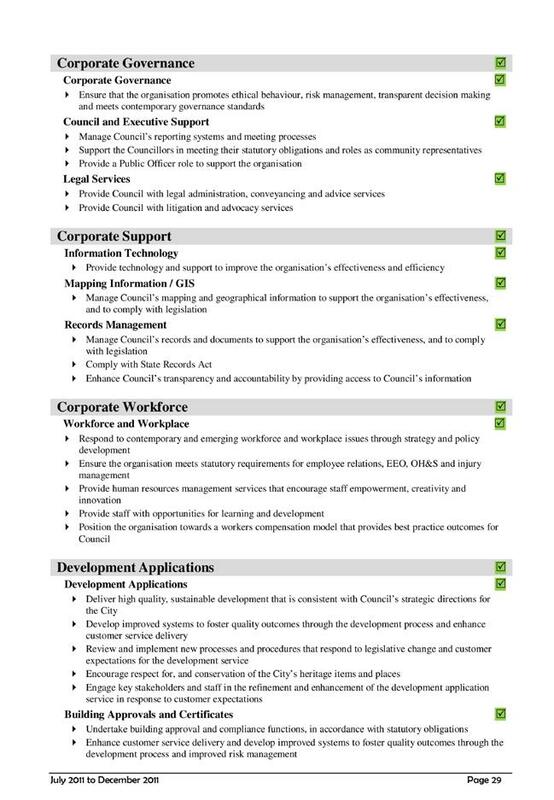 A summary of the remaining 11 exception items have been included in this report with further details and the challenges they are facing being included in Attachment 1 – 2011-12 Operational Plan, Services Performance and Financial Review Summary. 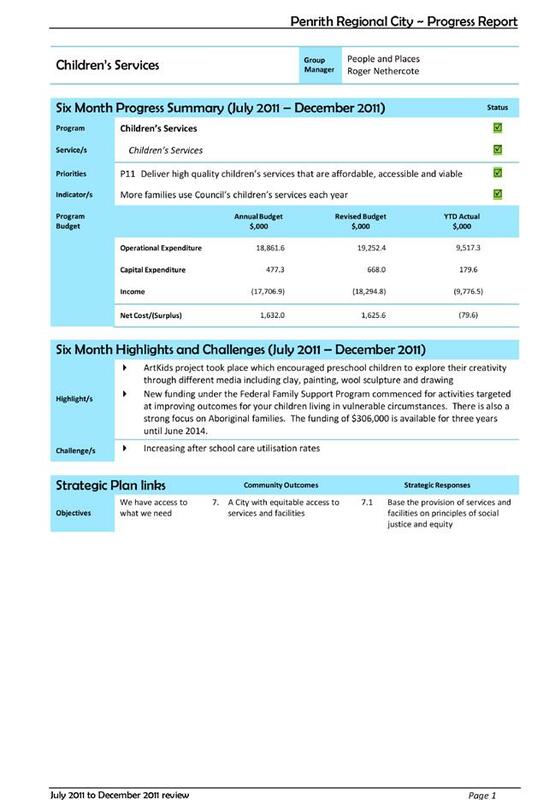 The December quarter has continued to show that Council’s short term financial position remains sound, and the recent improvements in the residential property market and a strong focus on controlling costs have combined to provide a cumulative surplus budget result for the six months to 31 December 2011 of $606,741. This has most notably been achieved through additional rates income ($357,847) and development related income ($310,000). 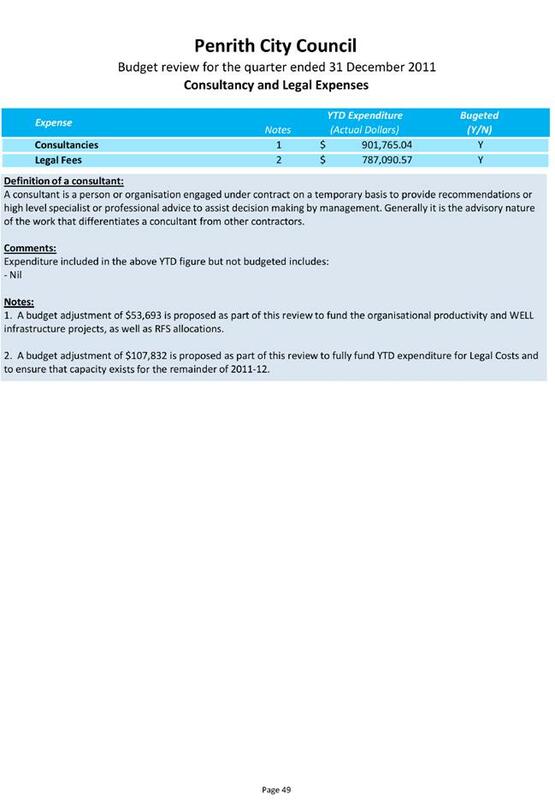 This result has also provided for the allocation of funds to the Legal Services budget ($120,000) to ensure that Council has the capacity to respond to any emerging issues following a number of significant matters remaining ongoing, and an investment in further productivity initiatives ($44,000). 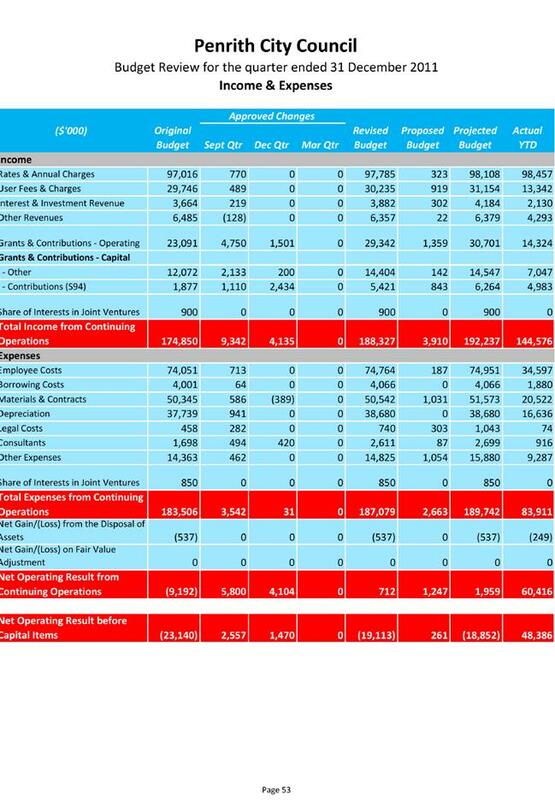 Net salary savings of $277,059 have been identified and it is considered prudent that these salary savings be retained within the employee costs budget at this stage and not reallocated. Council confirmed its commitment to ensuring that sufficient provision is made for Employee Leave Entitlements (ELE) during the 2010-11 June Quarter and Year End Review when it endorsed the transfer of net salary savings to the ELE Reserve for 2011-12. 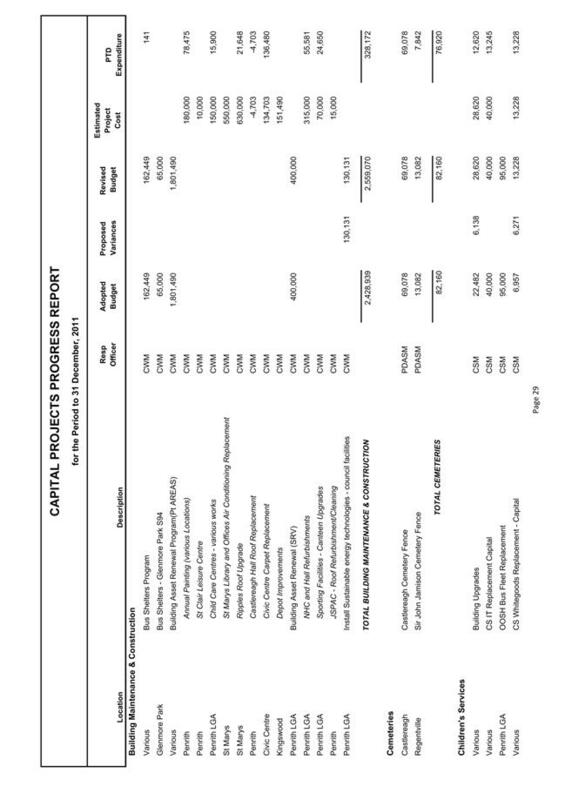 The 2011-12 Operational Plan identified budget adjustments that were retained in the Asset Reserve to ensure that any movement in assumptions or emerging priorities could be accommodated. 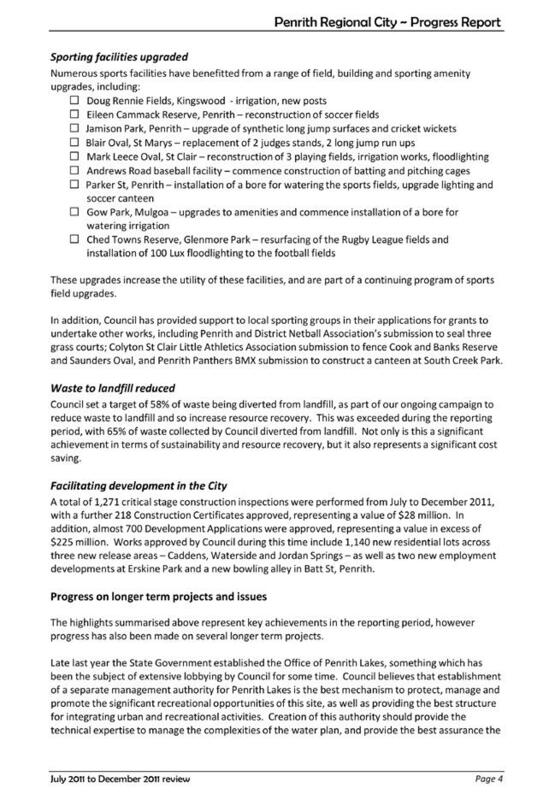 This review proposes the allocation of funding from the Asset Reserve to two new High Priority Projects, to Wi fi enable the Civic Centre ($52,441) and implement a new Customer Management System and upgrade Access Control at Penrith Swimming Centre ($76,365). 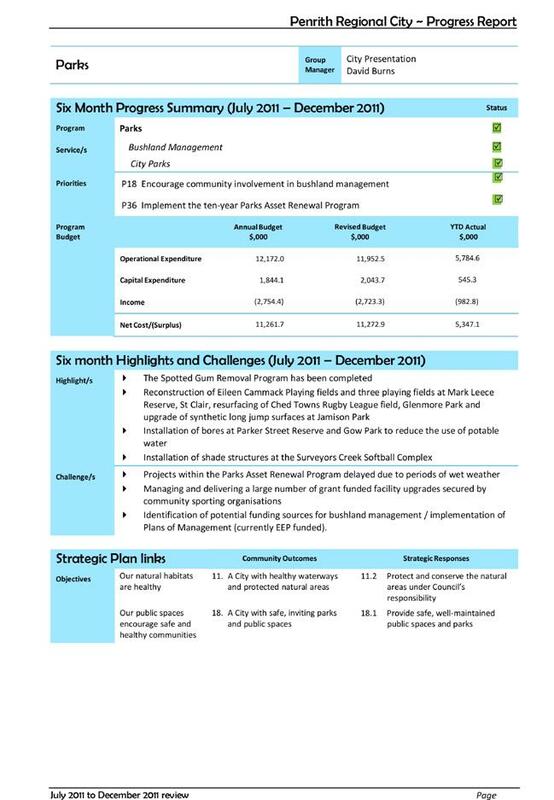 It is however considered prudent that the allocation of the reported surplus ($606,741) and the remainder of the Asset Reserve ($263,672) be delayed until a further reassessment of Council’s priorities has been completed, including consultation with Councillors at the upcoming Operational Plan Workshops. There are no revotes proposed as a result of the December Quarter Review. 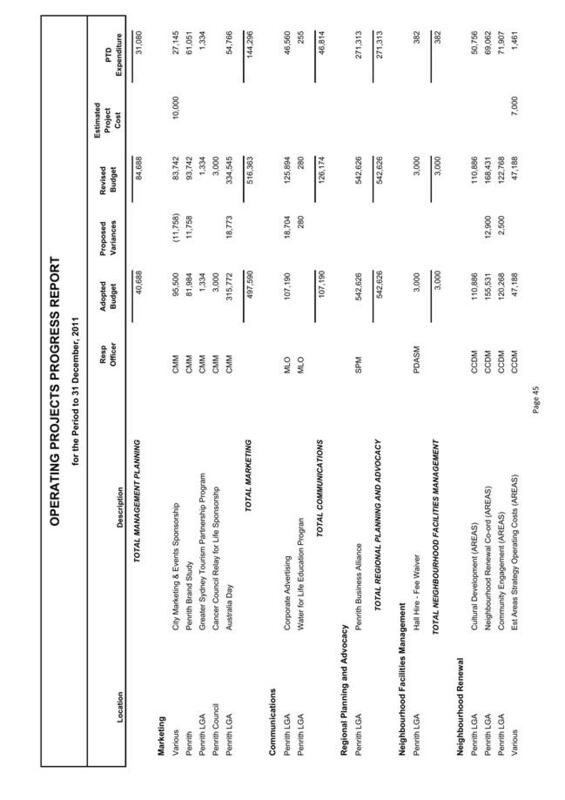 Further details on proposed major variations are provided later in this report and in Attachment 1 – 2011-12 Operational Plan, Services Performance and Financial Review Summary. 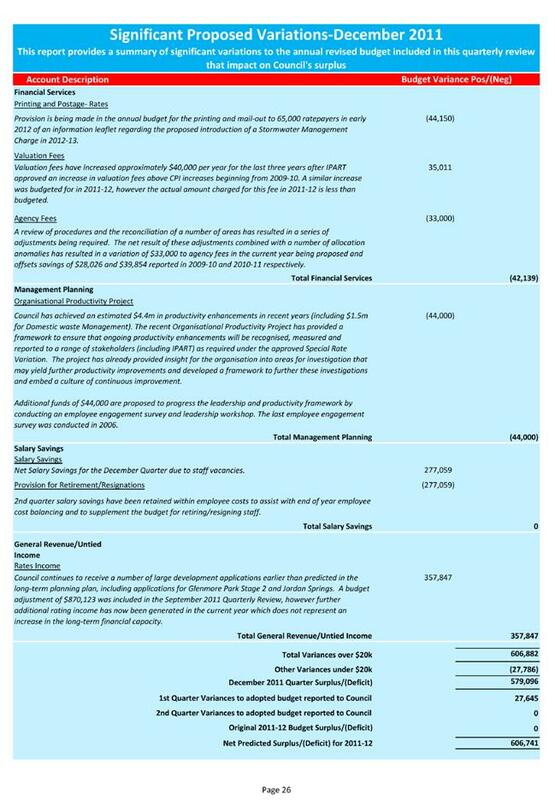 This report recommends that the revised budget estimates identified in the report and detailed in Attachment 1 – 2011-12 Operational Plan, Services Performance and Financial Review Summary be adopted. 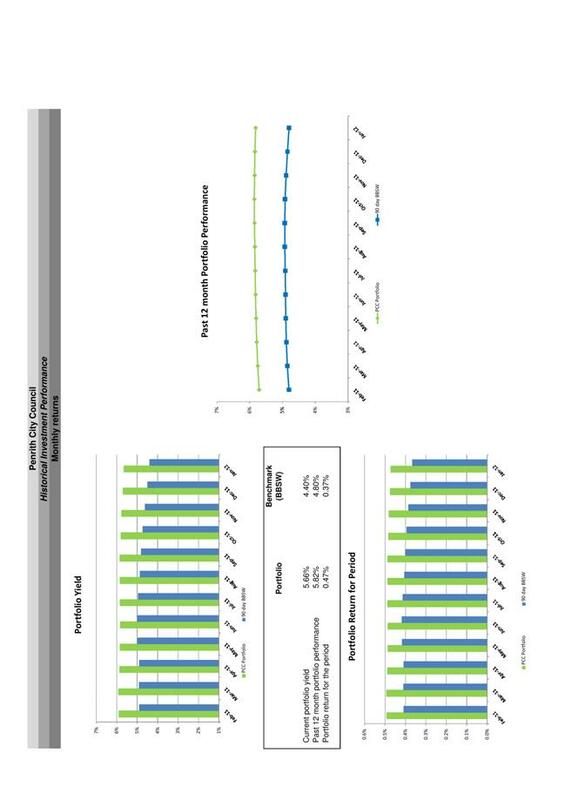 Progress for both the Delivery Program and Operational Plan is expressed through the use of actual results versus target expressed as percentages and ‘traffic light’ indicators. The rating scales and parameters for each ‘traffic light’ are explained below. A service activity, task, project, budget, program indicator or KPI is within 10% of targeted performance for that YTD period. A service activity, task, project, budget, program indicator or KPI is within 10% - 25% of targeted performance. It is at risk of non-completion, and may be the subject of a proposed carry over or partial revote of works. A comment is required about the issue, the focus required, and what will be done to address it. A service activity, task, project, budget, program indicator or KPI is more than 25% off its targeted performance and/or is the subject of a proposed revote of works. A comment is required about the issue, the focus required, and what will be done to address it. Completed (usually applies to Capital & Operating Projects and Tasks with defined target dates). Represents 100% completion. 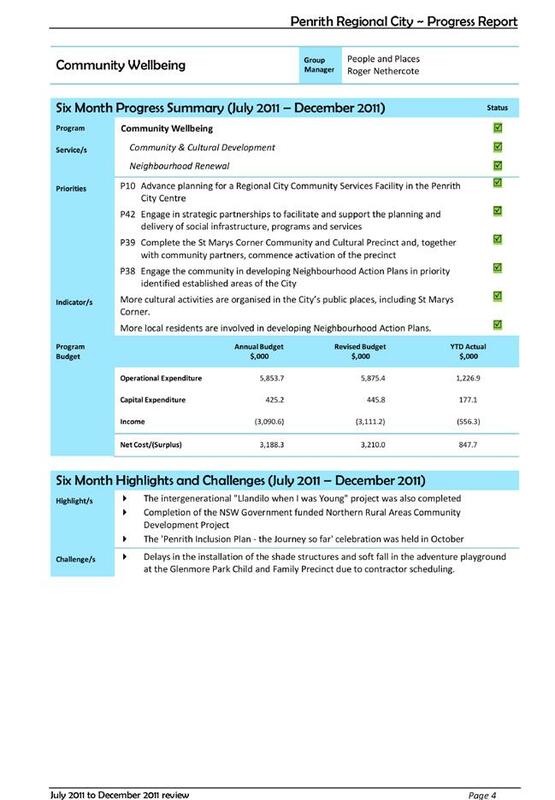 The Operational Plan progress report for the period ending 31 December 2011 is the second quarterly review of Council’s 2011-12 Operational Plan, which in turn contributes to the achievement of Council’s Delivery Program 2009-2013. 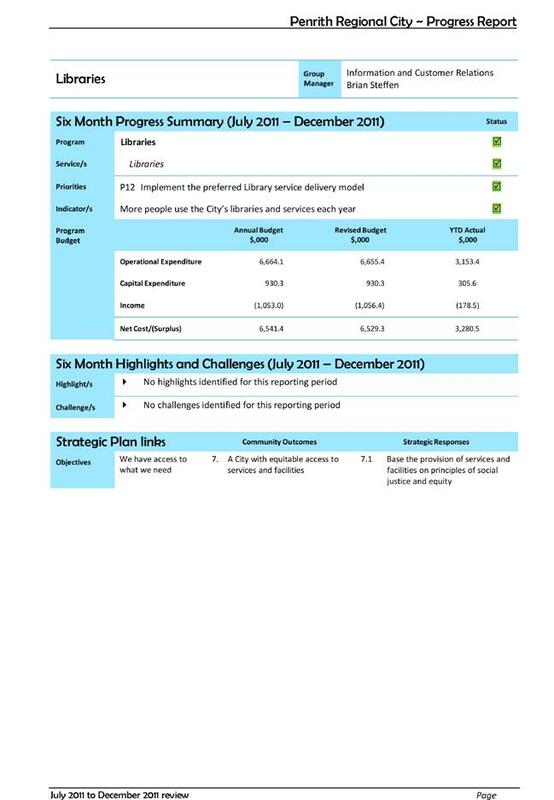 Council’s Performance Planning System indicates that the combined effort of all services for the three month period ending 31 December 2011 has resulted in a 51.3% achievement of the yearly requirement as required under the adopted 2011-12 Operational Plan. This result is encouraging demonstrating that services performance was 1.3% above the target of 50% at this stage of the year. 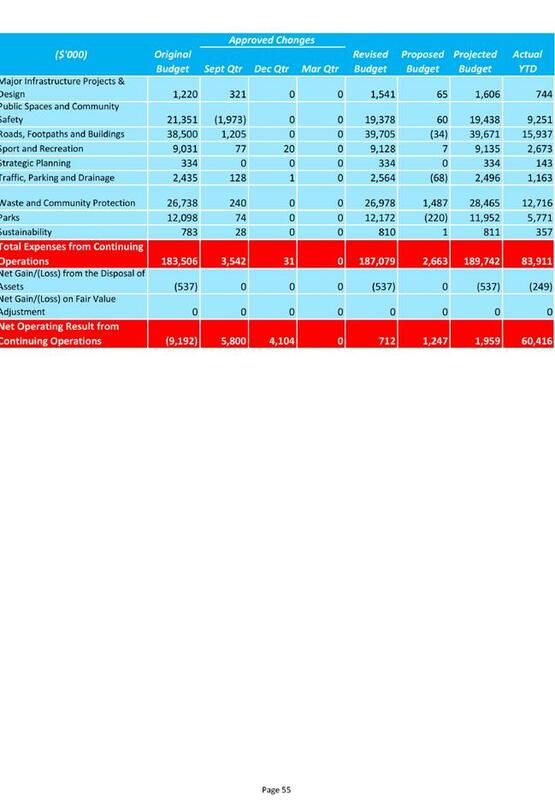 The contributing factors to this result are summarised in the table below. · 98% of Operating Projects were Completed or On Target. 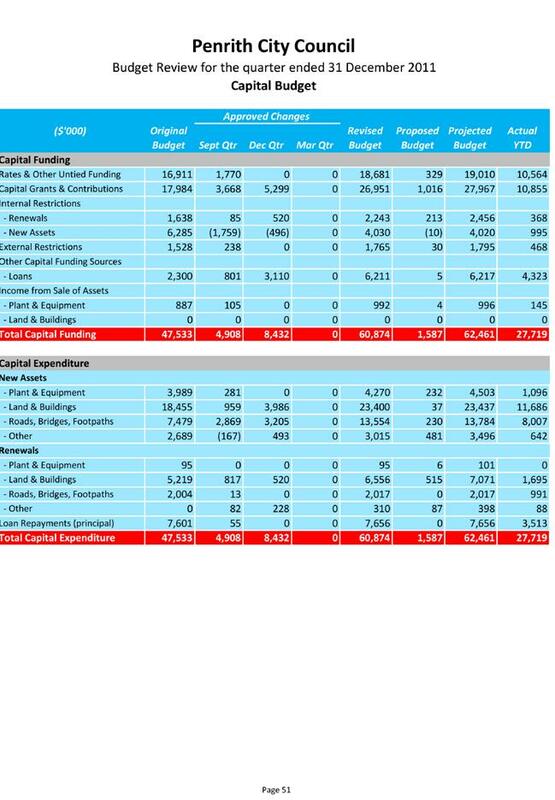 It is generally the case that for the second quarter in any Operational Plan year that most reporting elements would normally be “on track” especially given that a large number of projects are phased for completion in the remaining half of the year. Bank rehabilitation, scour protection and associated revegetation works near Ainsbury Road, St Marys were completed in the quarter including the additional planting works. Stormwater discharge was previously eroding the site which is in the riparian zone of South Creek. The project was funded through Council’s Enhanced Environmental Program. A concrete base for the long jump run up has been installed with a synthetic surface being laid on top. The long jump pits have been extended and the installation of the judges stands have been completed. $107,000 worth of new floodlighting was installed providing 100 lux lighting for the southern fields at Ched Towns Reserve. These lights will be used extensively during the 2012 winter season. This project relates to an audit of all shade structures in the outdoor play environment across all Children's Services sites to ensure they meet compliance with sun protection for staff and children. All audits and rectification work has now been completed which included tree planting and the replacement of some shade coverings. Each service now has a computer which is accessible for all staff. Centre staff have also now been trained in the use of the Employee Self Service system which enables them to check leave balances, make leave applications and access their payroll details. Playground upgrades at Jamisontown and Kindana Children's Centres were completed this quarter. Work included a new deck, general maintenance and sandpit top up. These upgrades ensure that the playground areas continue to be safe environments for children and staff. A new electronic scoreboard has been installed at Howell Oval and is being utilised by Penrith District Grade Cricket Club. 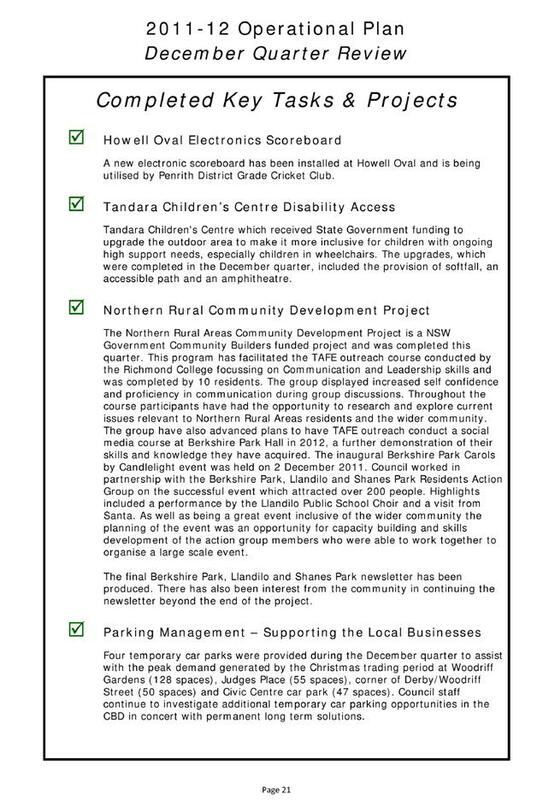 Tandara Children's Centre which received State Government funding to upgrade the outdoor area to make it more inclusive for children with ongoing high support needs, especially children in wheelchairs. The upgrades, which were completed in the December quarter, included the provision of softfall, an accessible path and an amphitheatre. The Northern Rural Areas Community Development Project is a NSW Government Community Builders funded project and was completed this quarter. This program has facilitated the TAFE outreach course conducted by the Richmond College focussing on Communication and Leadership skills and was completed by 10 residents. The group displayed increased self confidence and proficiency in communication during group discussions. Throughout the course participants have had the opportunity to research and explore current issues relevant to Northern Rural Areas residents and the wider community. The group have also advanced plans to have TAFE outreach conduct a social media course at Berkshire Park Hall in 2012, a further demonstration of their skills and knowledge they have acquired. The inaugural Berkshire Park Carols by Candlelight event was held on 2 December 2011. Council worked in partnership with the Berkshire Park, Llandilo and Shanes Park Residents Action Group on the successful event which attracted over 200 people. Highlights included a performance by the Llandilo Public School Choir and a visit from Santa. As well as being a great event inclusive of the wider community the planning of the event was an opportunity for capacity building and skills development of the action group members who were able to work together to organise a large scale event. The final Berkshire Park, Llandilo and Shanes Park newsletter has been produced. There has also been interest from the community in continuing the newsletter beyond the end of the project. Four temporary car parks were provided during the December quarter to assist with the peak demand generated by the Christmas trading period at Woodriff Gardens (128 spaces), Judges Place (55 spaces), corner of Derby/Woodriff Street (50 spaces) and Civic Centre car park (47 spaces). Council staff continue to investigate additional temporary car parking opportunities in the CBD in concert with permanent long term solutions. 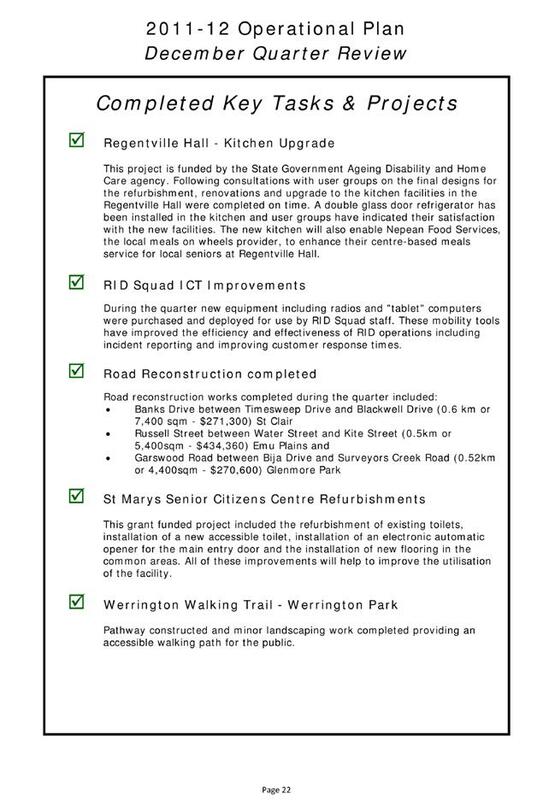 This project is funded by the State Government Ageing Disability and Home Care agency. Following consultations with user groups on the final designs for the refurbishment, renovations and upgrade to the kitchen facilities in the Regentville Hall were completed on time. A double glass door refrigerator has been installed in the kitchen and user groups have indicated their satisfaction with the new facilities. The new kitchen will also enable Nepean Food Services, the local meals on wheels provider, to enhance their centre-based meals service for local seniors at Regentville Hall. During the quarter new equipment including radios and "tablet" computers were purchased and deployed for use by RID Squad staff. These mobility tools have improved the efficiency and effectiveness of RID operations including incident reporting and improving customer response times. This grant funded project included the refurbishment of existing toilets, installation of a new accessible toilet, installation of an electronic automatic opener for the main entry door and the installation of new flooring in the common areas. 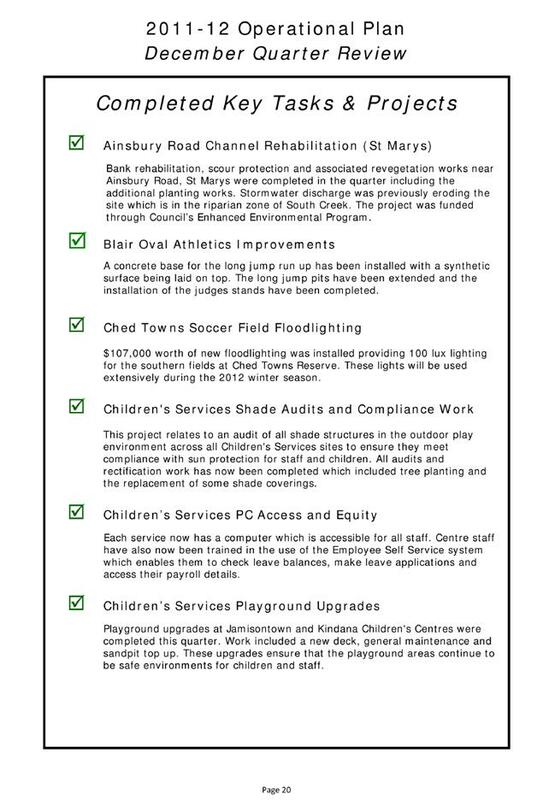 All of these improvements will help to improve the utilisation of the facility. Pathway constructed and minor landscaping work completed providing an accessible walking path for the public. 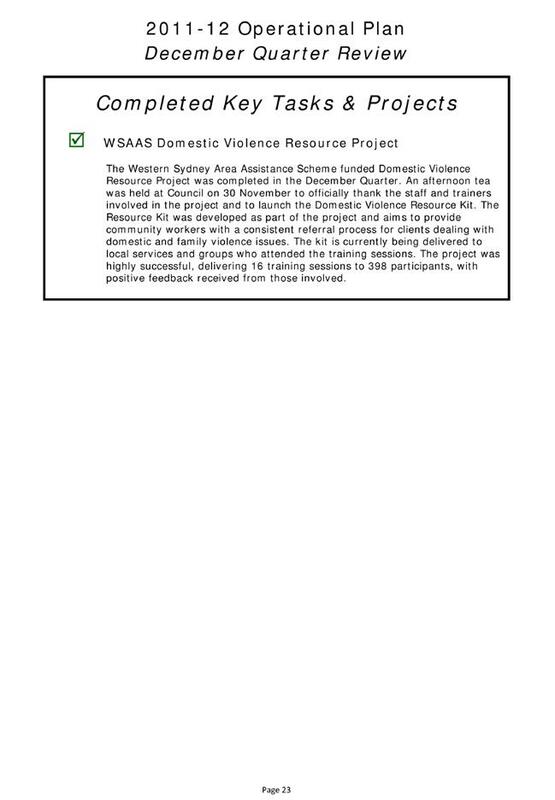 The Western Sydney Area Assistance Scheme funded Domestic Violence Resource Project was completed in the December Quarter. An afternoon tea was held at Council on 30 November to officially thank the staff and trainers involved in the project and to launch the Domestic Violence Resource Kit. The Resource Kit was developed as part of the project and aims to provide community workers with a consistent referral process for clients dealing with domestic and family violence issues. The kit is currently being delivered to local services and groups who attended the training sessions. The project was highly successful, delivering 16 training sessions to 398 participants, with positive feedback received from those involved. 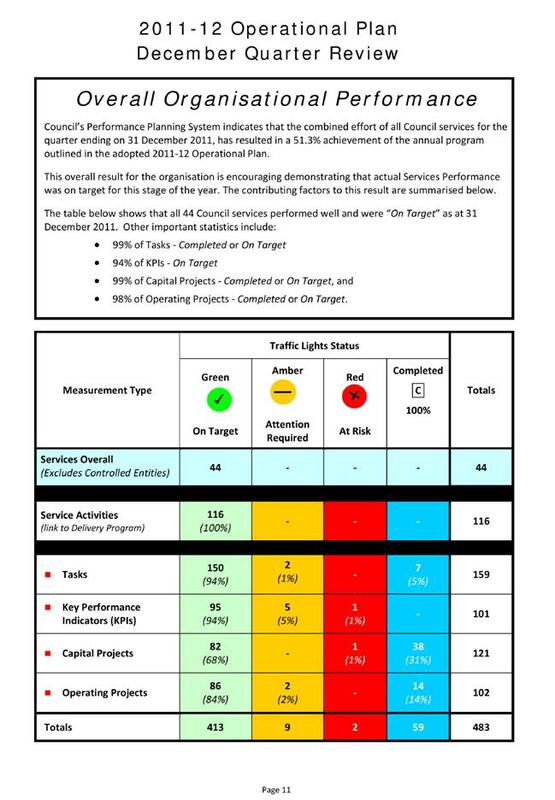 A total of 11 Tasks, KPIs and Projects in 9 services were identified in the Services Performance Summary (Table 3) as being an ‘Amber’ Traffic Light ‘requiring attention’ or a ‘Red’ Traffic Light ‘at risk’ of not being delivered or ‘not achieved this quarter’. A complete listing, sorted by individual service, is provided in Table 5 below with commentary/remedial action also provided. Water & Energy Management Plans. Funding is proposed to be returned to sustainability revolving fund. 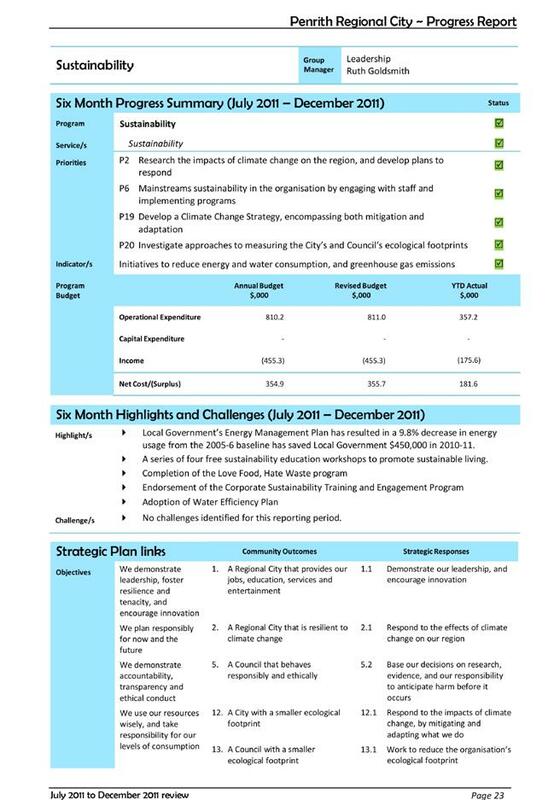 A revised Energy Savings Action Plan is currently under development and this program will continue to implement the Plan in 2012-13 once completed. In addition it is recognised that many sustainability initiatives are now integrated into building upgrades and funded accordingly. Service delivery continues to be negatively impacted by the increased number of after school care programs being opened across the city particularly by the private school sector. Of Council’s nine after school care services, Erskine Park and Kindana in St Clair are showing minimal effects. Remedial action has been taken in the other seven services with rectification strategies including reducing operational costs (e.g. 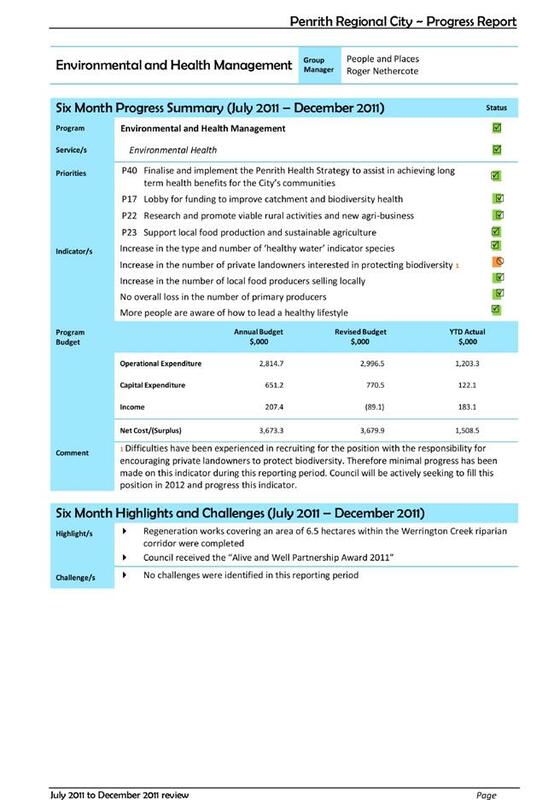 food and program costs) and reducing staffing expenditure being put in place. (All staff impacted have been able to be accommodated in other services without loss of hours). This situation will continue to be closely monitored and reported to the Board so that informed decisions can be made about the way forward for this service type. This project will not proceed in the short term due to the identified costs associated in the remediation of contamination present in the soil on the site. 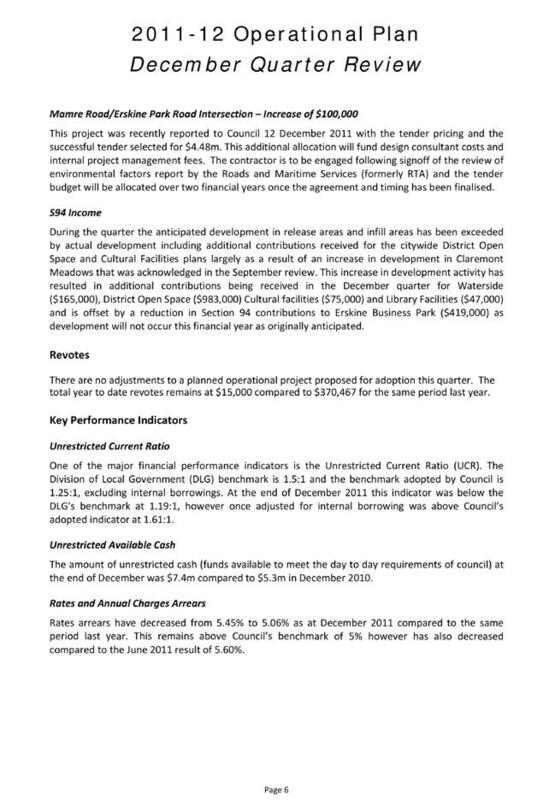 This matter was reported to Council on 12 December 2011 and it was determined that the grant funding be redirected to Ridge Park and Shepherd Street Park. The NSW Dept of Sport and Recreation (NSWDSR) & the Federal Government’s Regional and Local Facility Infrastructure Program (RLFIP) have been approached to amend the grant locations. 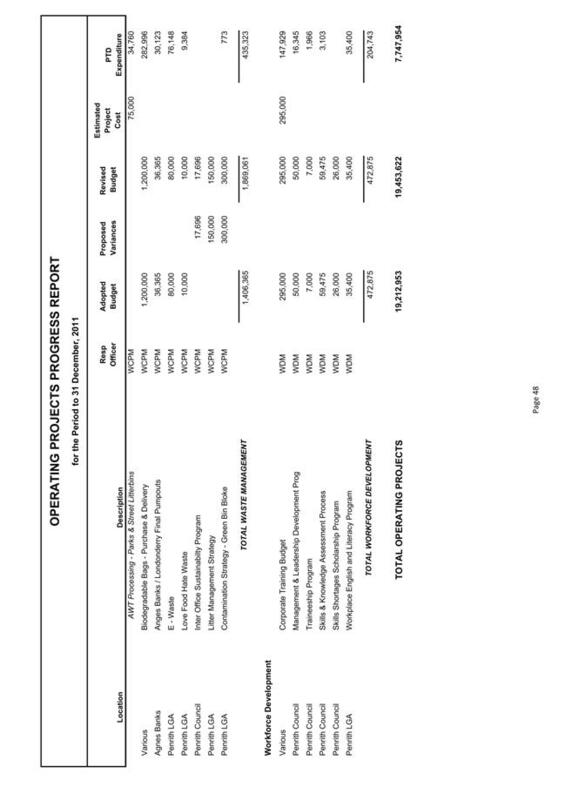 Pending this approval Council allocated $100,000 from the Telecommunication Access Fees Reserve as matching funds. Further investigations will be undertaken into the responsibility and liability for the management of site contamination on DoP land within the terms and conditions under which Council assumed care, control and management of this site, with the outcome of these investigations to be the subject of a further report to Council. 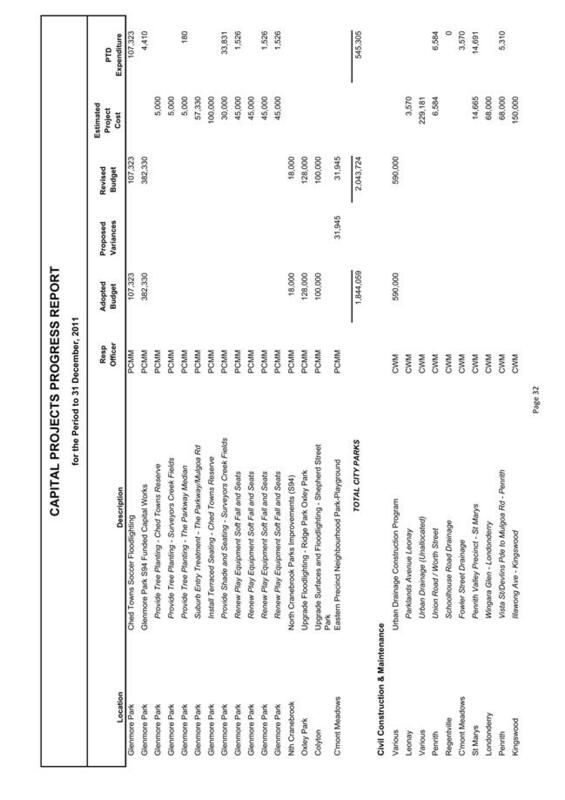 Designs have been completed for the selected roads, however, construction has been put on hold pending resolution of the DoP cap on S94 contributions. The designs for O'Connell Lane, have been provided to Landcom who will carry out construction for part of that road. The Nepean River Flood Study and investigations are progressing, however the finalisation of the study has been delayed pending confirmation of the future of the PLDC lands. Analysis to date has been based on anticipated land forms that dates back to 2004, and confirmation of the contemporary planning for the lakes scheme is required to inform the finalisation of the Nepean River flood study. Council is seeking urgent meetings with PLDC and the relevant government agencies. In relation to South Creek, the floodway analysis is almost complete and the floodway definitions are now being finalised. 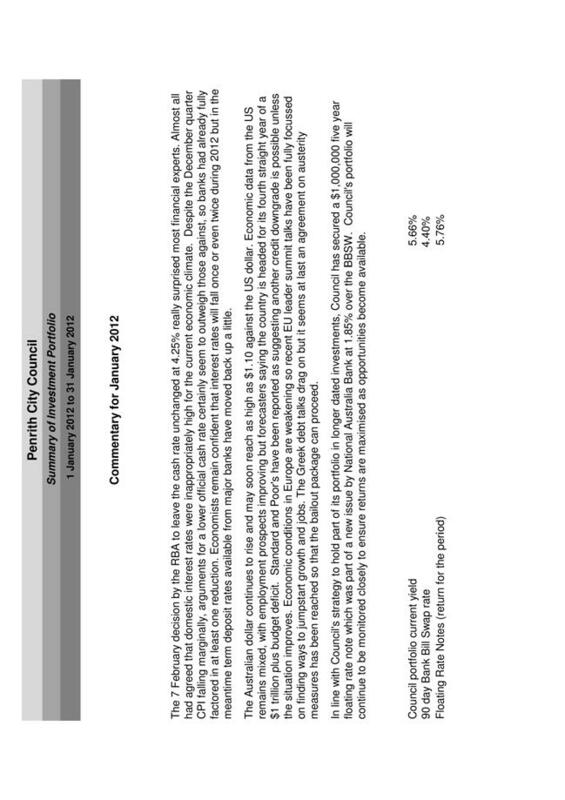 It is anticipated that the findings of the South Creek analysis will be presented to Council mid 2012. Circulations are slightly below target for this quarter and will be monitored over the coming months. Results are 15% below target for this quarter. These statistics are based on State Library of NSW quarterly survey and highlight the dramatic increase in reference based searches through the internet at home versus the use of the electronic resources at libraries. Programs are in place to promote visits to the library. A review of the indicators is being undertaken to include on-line visits with personal visits. This KPI was previously reported in the September Quarter Review. A review of current stock holdings and activity has begun as part of a more comprehensive service review. This KPI was previously reported in the September Quarter Review. 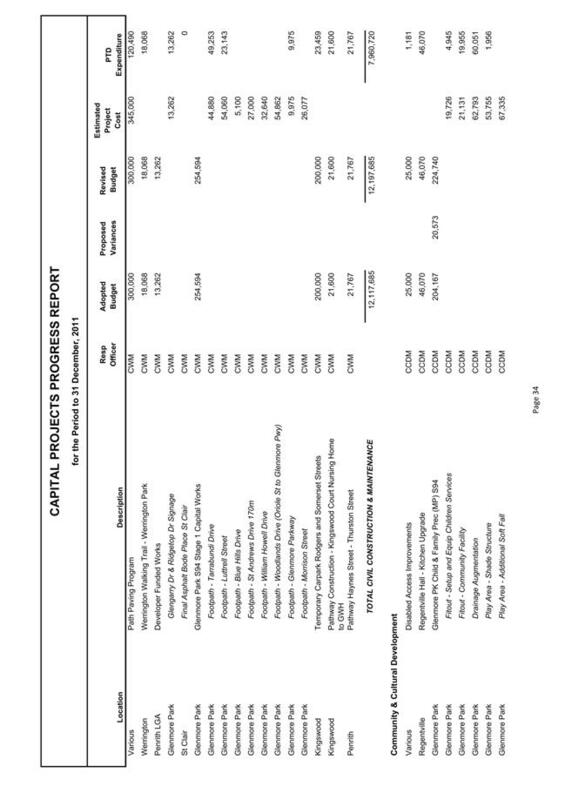 Allocation of resources to organisational priorities including the review of the City Indicators Framework, the 2 Year Delivery Program Review, and application and the city-wide LEP has resulted in minimal progression of the Penrith Planning Strategy. 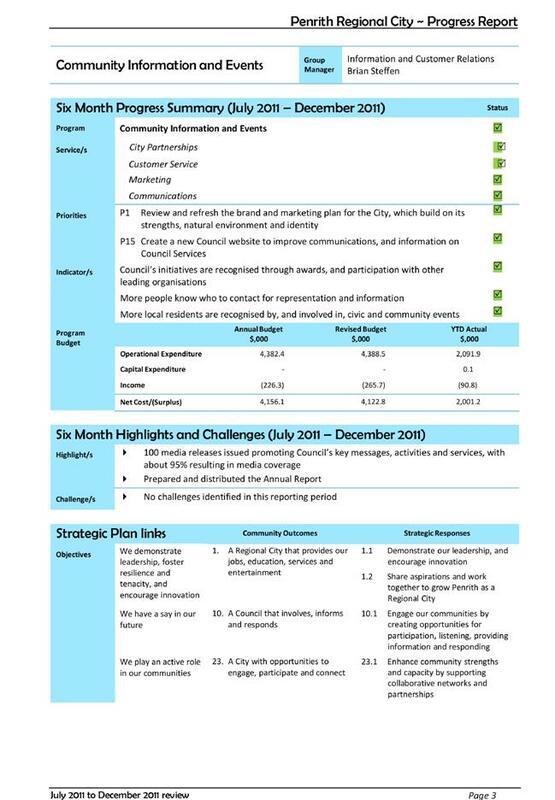 Priorities for the next 6-18 months involve the review and wrap-up of the current Community Strategic Plan and community engagement and development of Council’s next suite of strategic planning documents. Following a detailed review of growth assumptions and projections for the Penrith City Centre, the detailed traffic modelling and analysis has progressed. It is anticipated that this modelling will be complete by mid 2012. This analysis will provide a comprehensive review of traffic movements into the future and facilitate the strategic planning and implementation of key transport infrastructure and services. 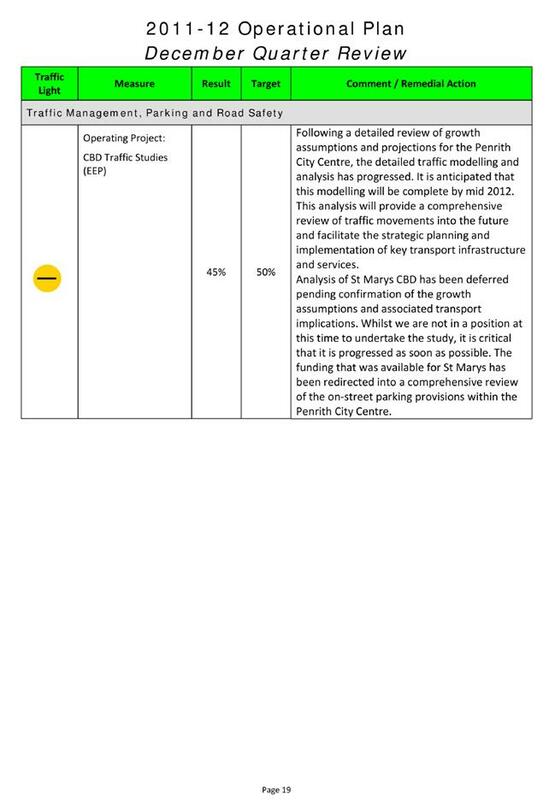 Analysis of St Marys CBD has been deferred pending confirmation of the growth assumptions and associated transport implications. Whilst we are not in a position at this time to undertake the study, it is critical that it is progressed as soon as possible. The funding that was available for St Marys has been redirected into a comprehensive review of the on-street parking provisions within the Penrith City Centre. 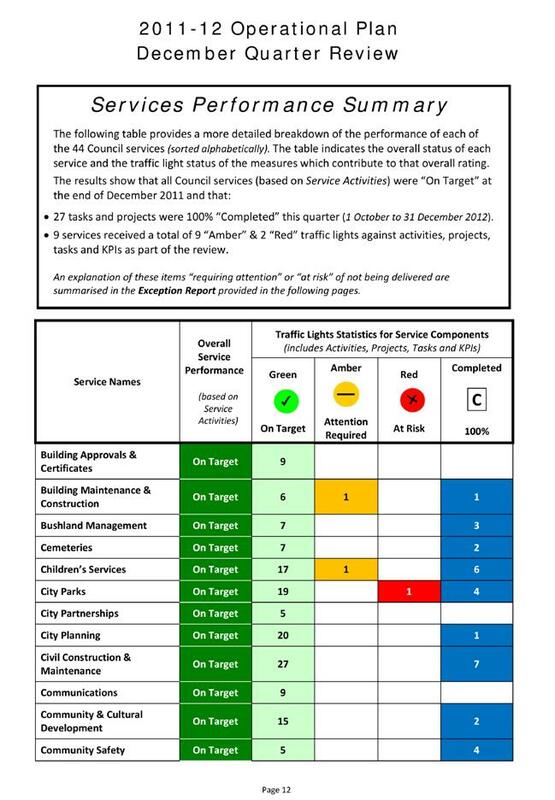 Progress for each of the exceptions listed above will continue to be monitored and remedial action taken to return these to a “Green” traffic light “On Target” status where possible. The predicted cumulative result for the year as at December is a surplus of $606,741 after the recommended variations for the quarter. 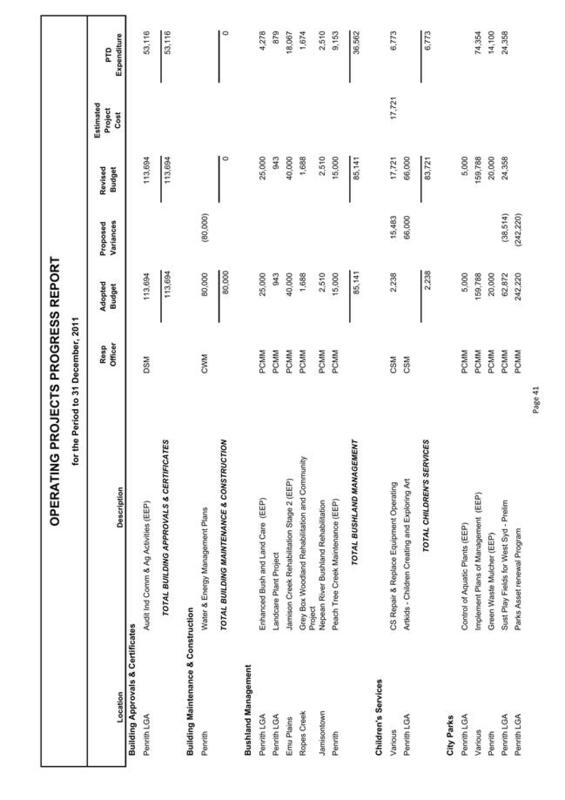 Commentary is provided below on some of the more significant issues in the review with further details together with all proposed minor variations, and reserve movements detailed in Attachment 1 – 2011-12 Operational Plan, Services Performance and Financial Review Summary. Estimated annual rating income is affected by development throughout the city (i.e. subdivisions) and is based on the rating data available at a particular point of time. 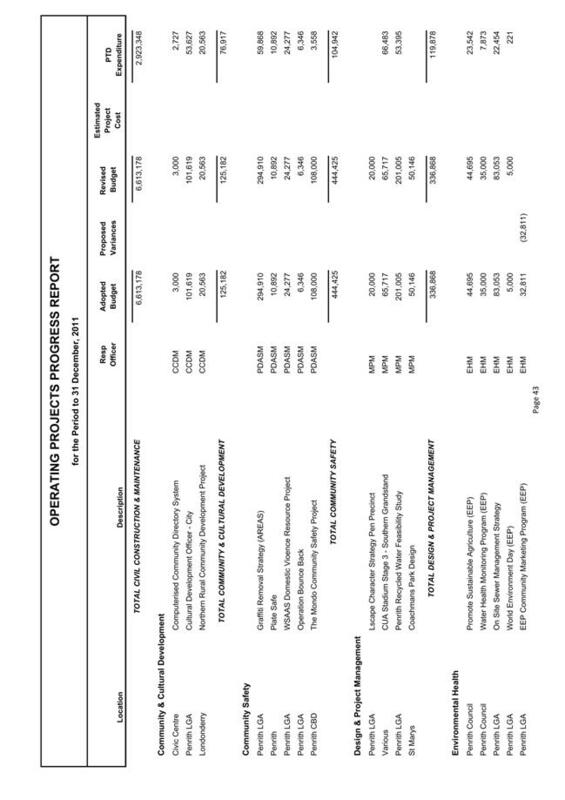 In the September 2011 Quarterly Review an increase in rates income of $870,123 was included in the annual budget. This increase in rating income was largely the result of two large releases of land that occurred at Glenmore Park Stage 2 and Jordan Springs. 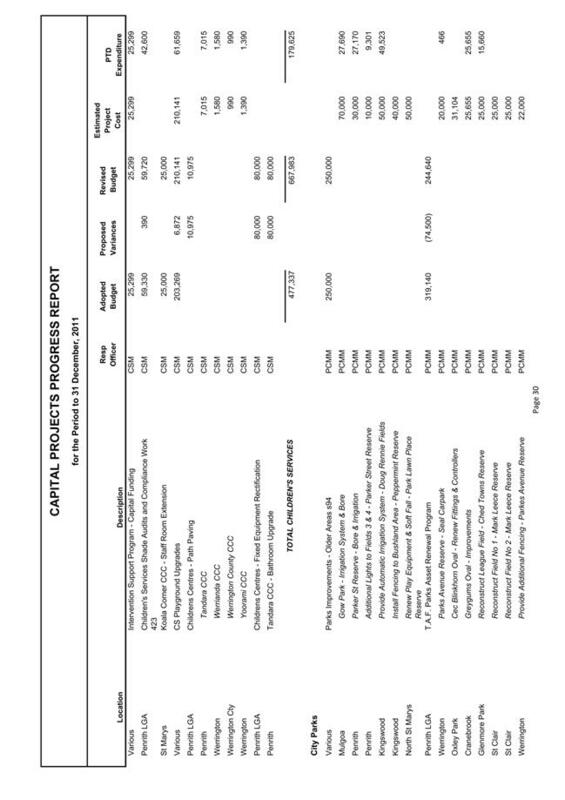 These developments have continued to generate further rates income with an additional $357,847 (0.4%) now proposed to be included in the annual budget. 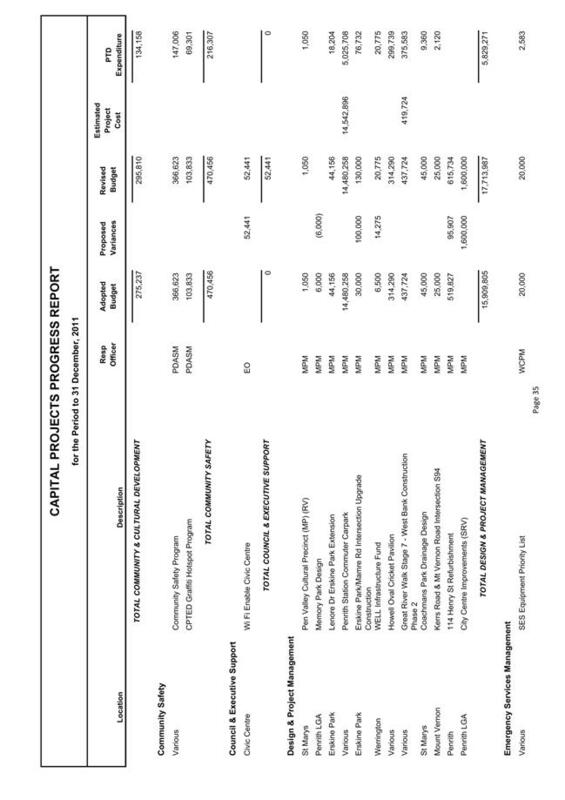 Once again, it is important to note that this income was predicted to be received in future years in Council’s Long Term Financial Plan and as such does not provide any additional financial capacity in future years. This additional income, in conjunction with reduced Valuation Fees ($35,011 – 11%), has been partly offset by an increase in estimated printing and postage costs ($44,150 – 26%). During the second quarter of 2011-12 salary savings have been realised primarily due to vacancies across a number of departments. The majority of these vacant positions are in the process of being filled. It is recommended that some of the identified salary savings are retained in the individual departments to enable the engagement of consultants or temporary staff to ensure the delivery of key Operational Plan tasks and projects. 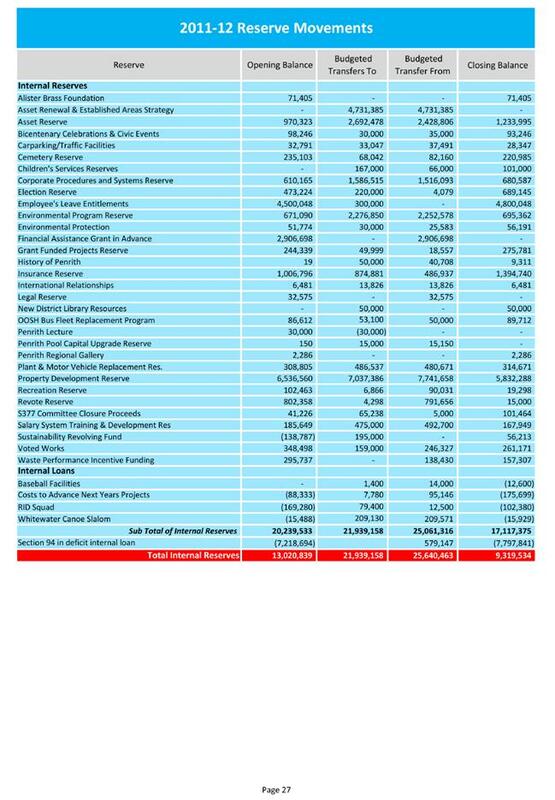 The salary savings, net of those being retained by departments, total $277,059. 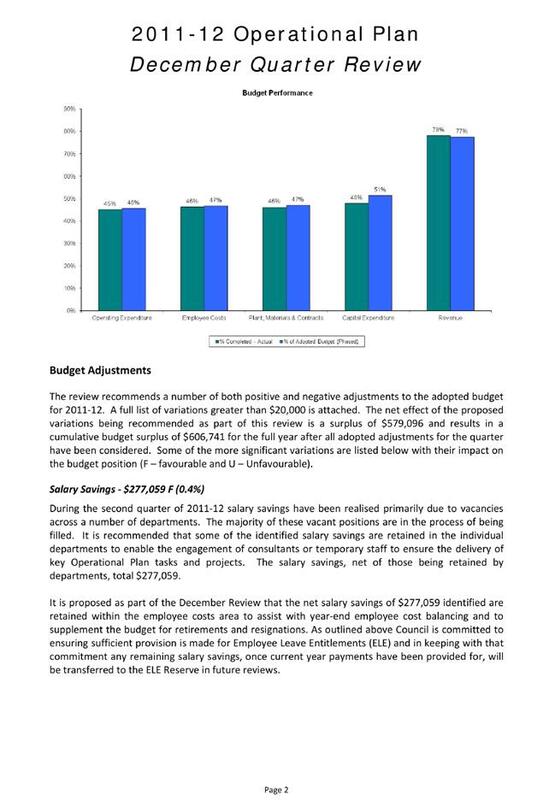 It is proposed as part of the December Review that the net salary savings of $277,059 identified are retained within the employee costs area to assist with year-end employee cost balancing and to supplement the budget for retirements and resignations. As outlined above Council is committed to ensuring sufficient provision is made for Employee Leave Entitlements (ELE) and in keeping with that commitment any remaining salary savings, once current year payments have been provided for, will be transferred to the ELE Reserve in future reviews. An increased number of Construction and Compliance Certificates are being processed, compared to the original estimates. This follows favourable economic conditions that have stimulated growth in this area, resulting in an increase in residential subdivision activity. This increase is primarily the result of Council being appointed as the Certifying Authority for several large developments in Jordan Springs, North Penrith, Caddens Road, and Glenmore Park. An increase of $275,000 has been projected in the December Review to account for what has been received to date and what is expected to be received for the remainder of the year. 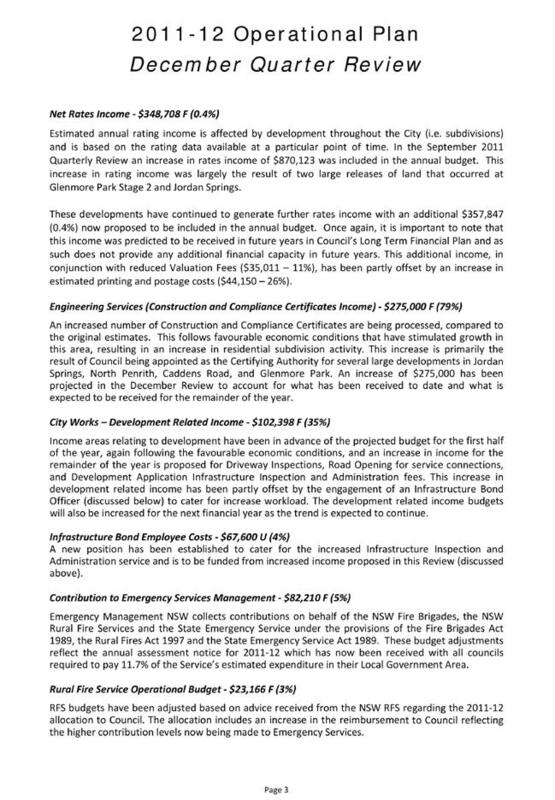 Income areas relating to development have been in advance of the projected budget for the first half of the year, again following the favourable economic conditions, and an increase in income for the remainder of the year is proposed for Driveway Inspections, Road Opening for service connections, and Development Application Infrastructure Inspection and Administration fees. 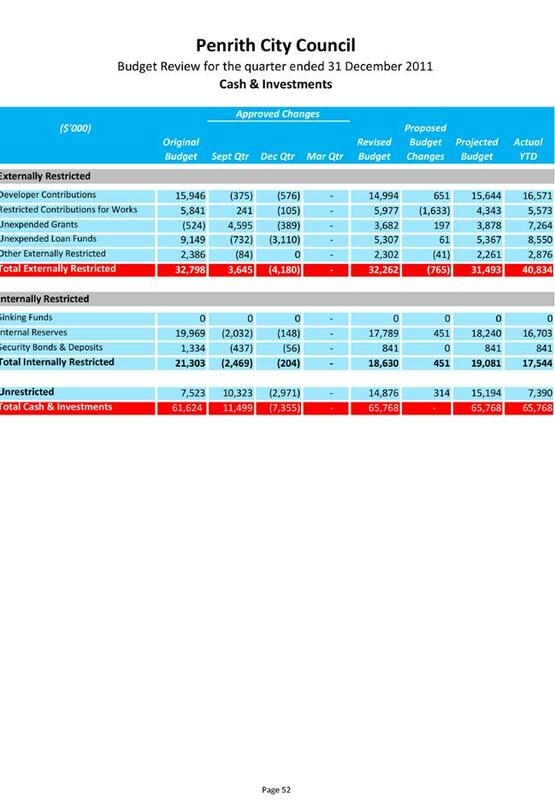 This increase in development related income has been partly offset by the engagement of an Infrastructure Bond Officer (discussed below) to cater for increase workload. The development related income budgets will also be increased for the next financial year as the trend is expected to continue. A new position has been established to cater for the increased Infrastructure Inspection and Administration service and is to be funded from increased income proposed in this Review (discussed above). Emergency Management NSW collects contributions on behalf of the NSW Fire Brigades, the NSW Rural Fire Services and the State Emergency Service under the provisions of the Fire Brigades Act 1989, the Rural Fires Act 1997 and the State Emergency Service Act 1989. 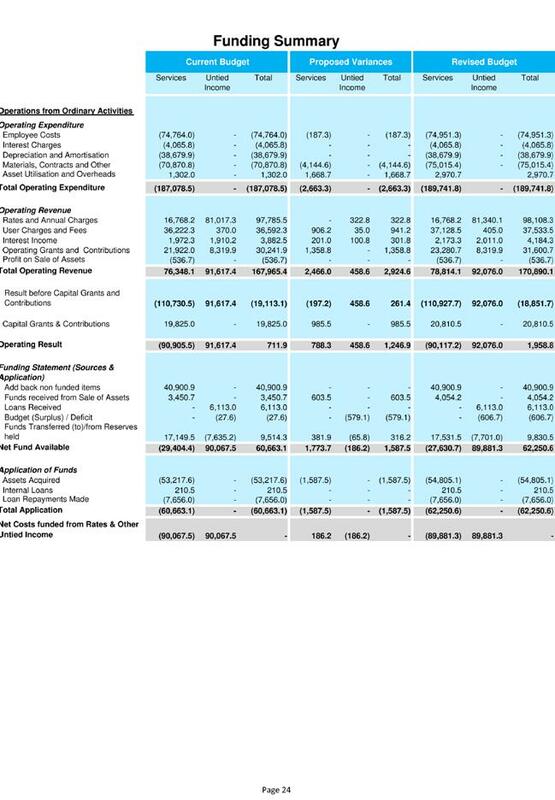 These budget adjustments reflect the annual assessment notice for 2011-12 which has now been received with all councils required to pay 11.7% of the Service’s estimated expenditure in their Local Government Area. This additional allocation has been provided to ensure that Council has the capacity to respond to current and emerging matters in the remaining six months of the year. This follows a number of significant matters, where the scope has been greater than originally anticipated, being litigated in the current year, including a number of appeals that were not original predicted. A number of other variations are proposed as part of this review that do not have an impact on the available funds. 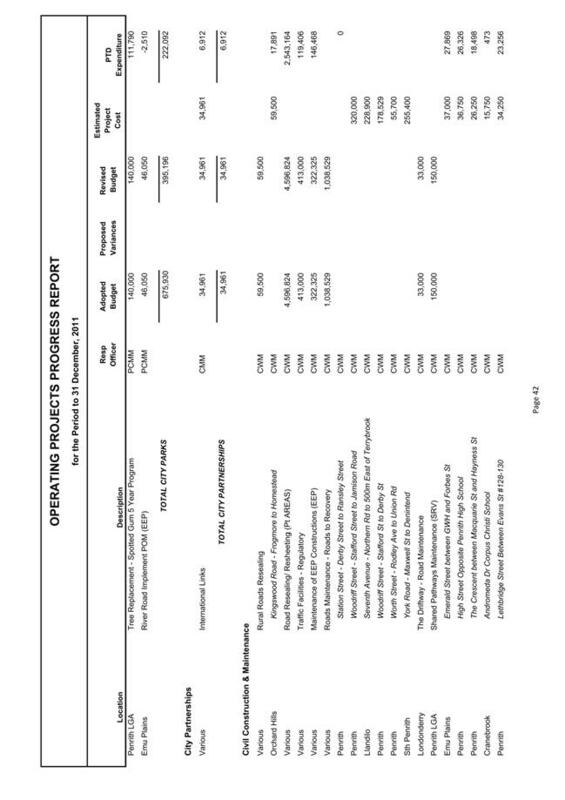 Details of these adjustments are provided in Attachment 1 – 2011-12 Operational Plan, Service Performance and Financial Review Summary. There are no revotes identified in the December Quarter Review and therefore the total value of revotes for the year to date remains at $15,000 compared to $370,467 for the same period last year. 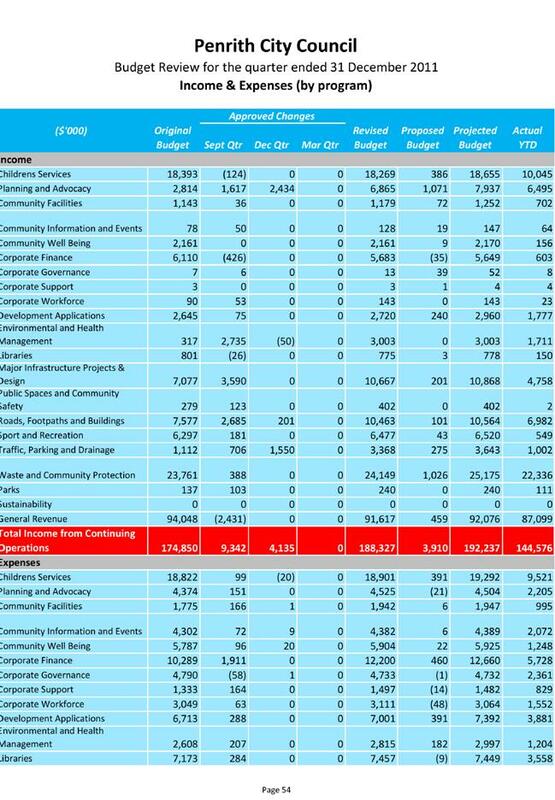 The 2011-12 Operational Plan December Quarter review indicates that the performance of Council Services is ‘on track’ to meet Council’s challenging annual program. 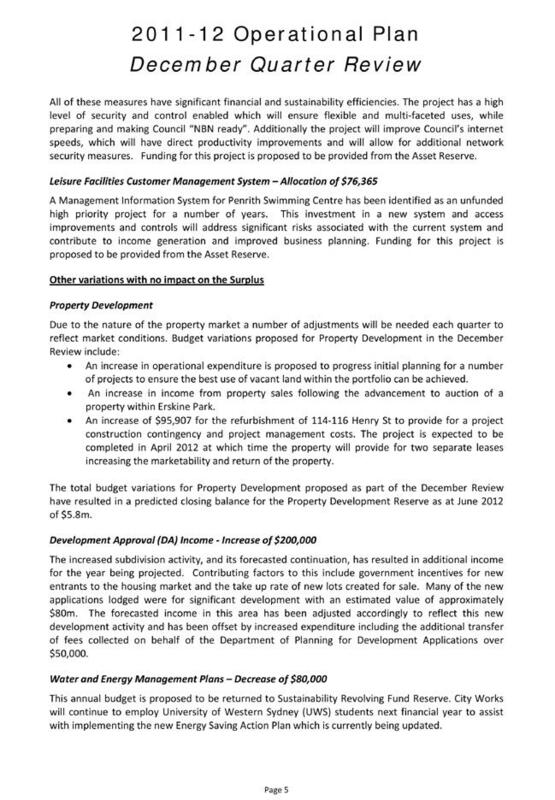 Strong Financial Management and improvements in the residential property market have contributed to a surplus of $606,741 being projected to June 2012. The review documents have been placed on Council’s website, and will also be available to the public in hard copy and CD versions on request. 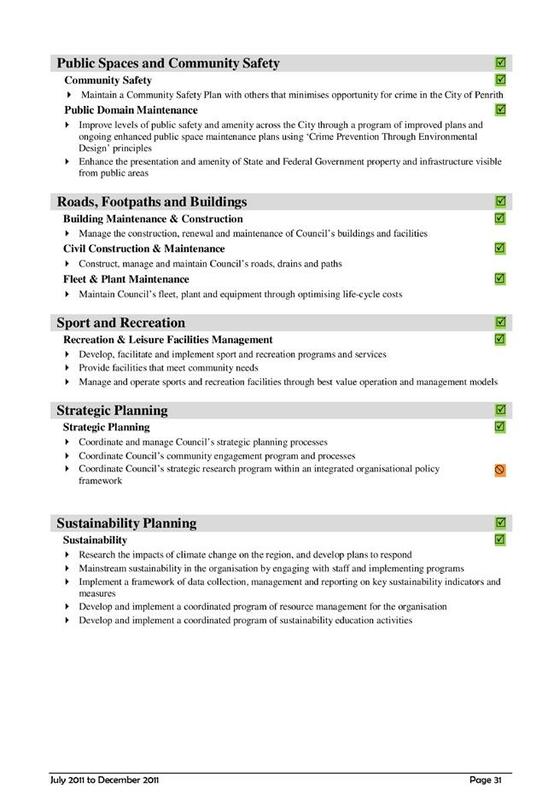 The opportunity is available for Council tonight to seek clarification or elaboration on particular matters in any section of this report, or the enclosed Services Performance and Financial Review Summary Report. 2. 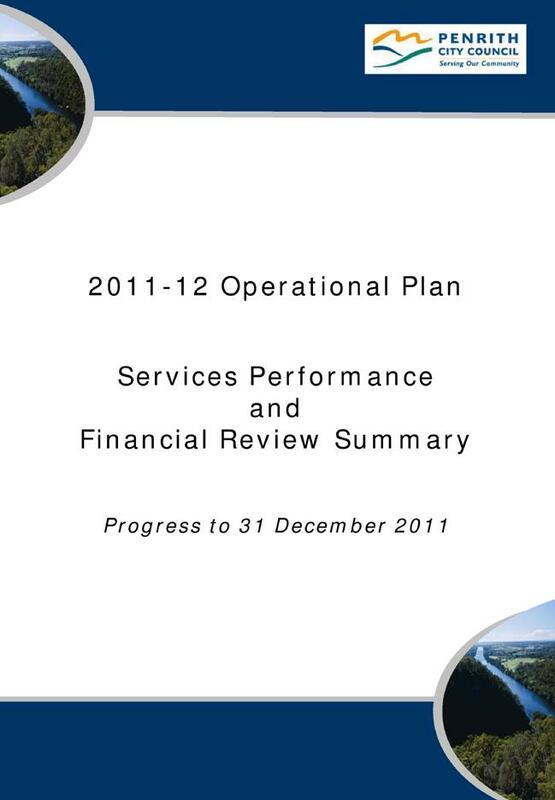 The 2011-12 Operational Plan Review as at 31 December 2011, including the revised estimates and revotes identified in the recommended budget outlined in this report and detailed in Attachment 1 – 2011-12 Operational Plan, Services Performance and Financial Review Summary be adopted. The 2012 Australian Local Government Association (ALGA) National General Assembly of Local Government will be held in Canberra from 17-20 June 2012. Penrith City Council is entitled to have one voting delegate at each plenary session and it is Council’s practice to send additional Councillors as observers to the Assembly. Presentations will be given at the Assembly from key political leaders. Council should nominate its voting delegate to attend the Assembly as well as observers, and grant leave of absence as appropriate. Motions for the Assembly under three themes (Infrastructure, Planning and Services) need to be submitted to the ALGA by no later than Friday 27 April 2012. It is recommended that a further report detailing suggested motions be considered at Council’s Policy Review Committee meeting to be held on 16 April 2012. The 2012 National General Assembly of Local Government will be held in Canberra from 17–20 June 2012. The National General Assembly, which is sponsored by the Australian Local Government Association (ALGA), will have as its theme, “National Voice, Local Choice – Infrastructure, Planning, Services”. 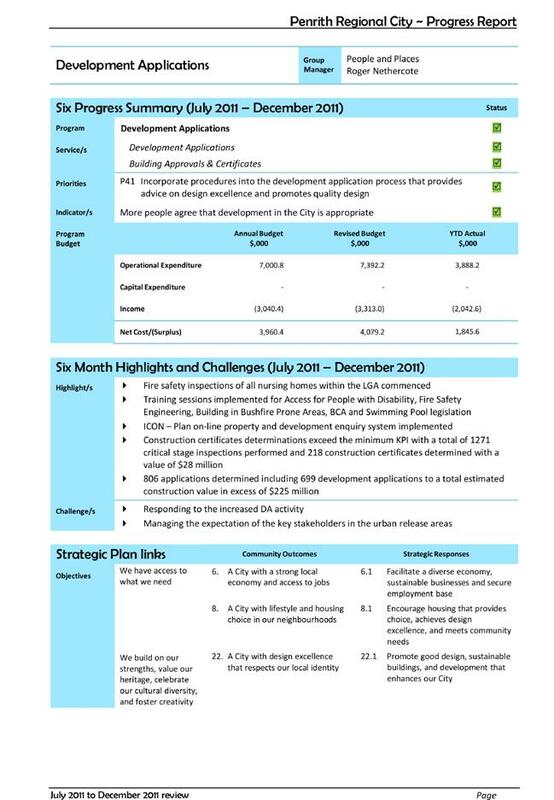 At this stage a draft program with speakers has not been prepared, Councillors will be advised of the program and speakers when a report is considered on the draft motions at Council’s Policy Review Committee meeting to be held on 16 April 2012. Each Council is entitled to have one voting delegate at each plenary session. In the past, in addition to selecting its voting delegate, Council has elected to send additional Councillors as observers. In 2011, Council’s voting delegate to the National General Assembly was Councillor Jim Aitken OAM, and the additional observers were Councillors Ross Fowler OAM, Marko Malkoc, Jackie Greenow and Karen McKeown. The aim is to stimulate ideas about new ways of doing business to meet the infrastructure and service needs of local people in their local communities. Motions for the Assembly need to outline credible ideas and policy initiatives that will strengthen local government’s capacity to respond to the social, economic and environmental challenges facing Australia. Motions that are carried by the National General Assembly become Resolutions. 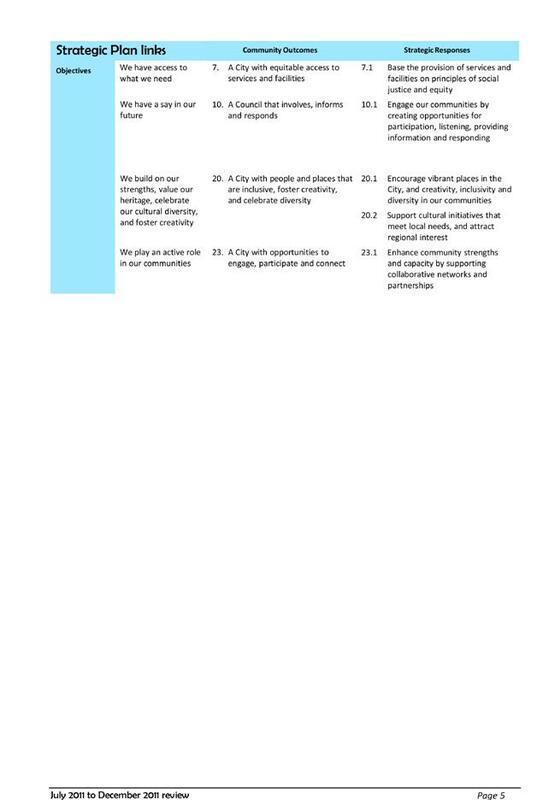 These Resolutions are then considered by the ALGA Board when setting national local government policy and will also feed into the Australian Council of Local Government processes. Motions need to be submitted to the ALGA by no later than Friday 27 April 2012. It is proposed to report on the draft Motions to the Policy Review Committee on 16 April 2012. 2. Council nominate its voting delegate for the 2012 National General Assembly of Local Government. 3. Council nominate those Councillors that will attend as observers at the 2012 National General Assembly of Local Government. 4. Leave of Absence be granted to all Councillors attending the 2012 National General Assembly of Local Government to be held in Canberra from 17-20 June 2012. 5. 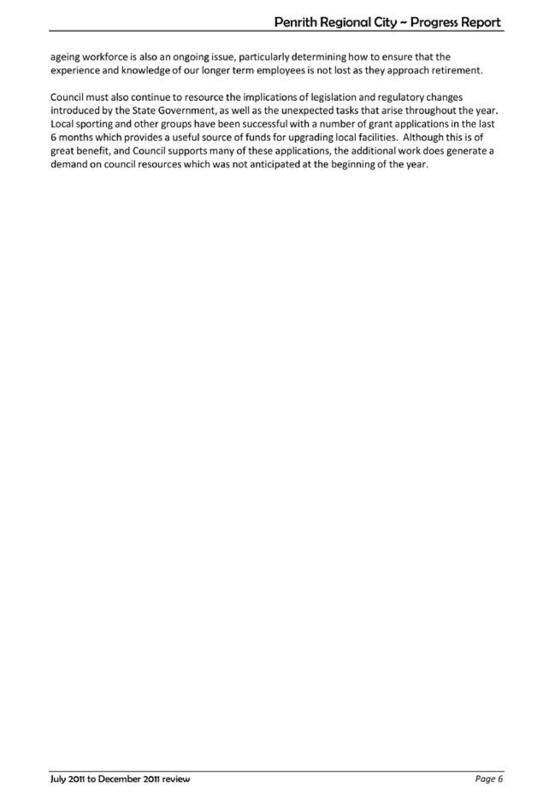 A further report detailing suggested motions be considered at Council’s Policy Review Committee meeting to be held on 16 April 2012. 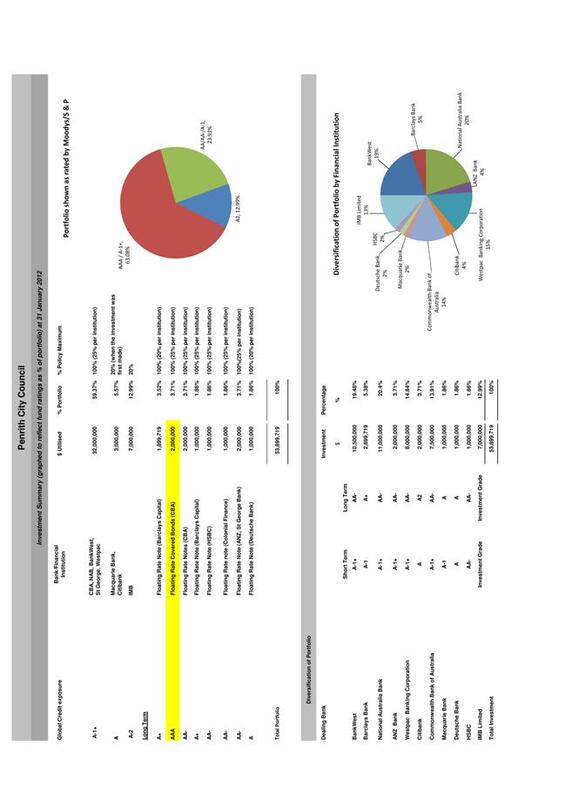 The purpose of this report is to provide a summary of investments for the period 1 January 2012 to 31 January 2012 and a reconciliation of invested funds at 31 January 2012. 2. 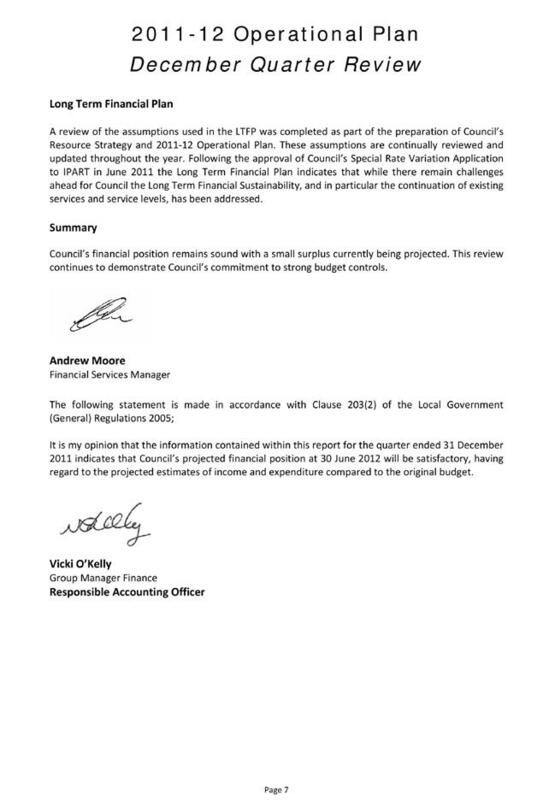 Council’s Cash Book and Bank Statements have been reconciled as at 31 January 2012. 2. 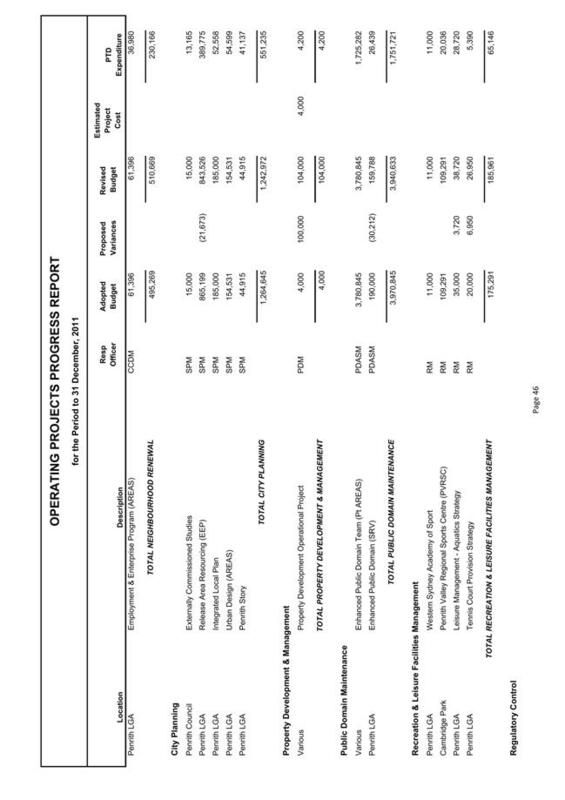 The Certificate of the Responsible Accounting Officer and Summaries of Investments and Performance for the period 1 January 2012 to 31 January 2012 be noted and accepted. 3. 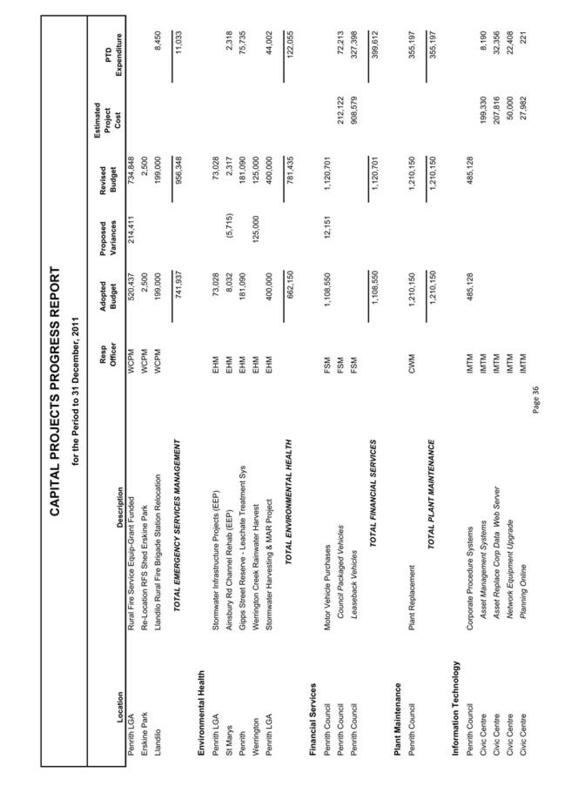 The graphical investment analysis as at 31 January 2012 be noted. Council approved subdivision application DA 01/2345 for the creation of seventeen (17) new allotments for rural residential purposes in Belleview Ave Mt Vernon in June 2004. As part of that approval, restrictive covenants under Section 88B of the Conveyancing Act 1919 were imposed. Penrith City Council is nominated as the authority whose consent is required to release, vary or modify, the terms of the restriction. The Siting Plan referred to in the restrictive covenant, nominates individual building envelopes for each site. 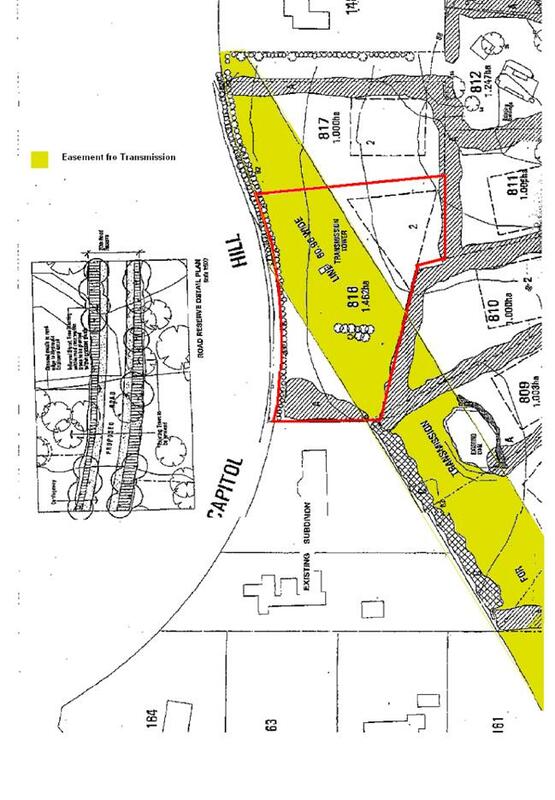 It was applied to the subdivision to maintain separation between buildings, and provide for preservation of established landscaping to the perimeters of the allotments (See Siting Plan in Appendix No. 2). The applicant has requested the above restriction be varied, permitting an existing masonry building to be approved outside the building envelope designated for the lot. The lot is traversed by an electrical easement which greatly reduces the available location for ancillary structures to the dwelling. The existing structure complies with the setback requirements of the DCP and is envisaged to have minimal impacts on the streetscape and amenity of the area. 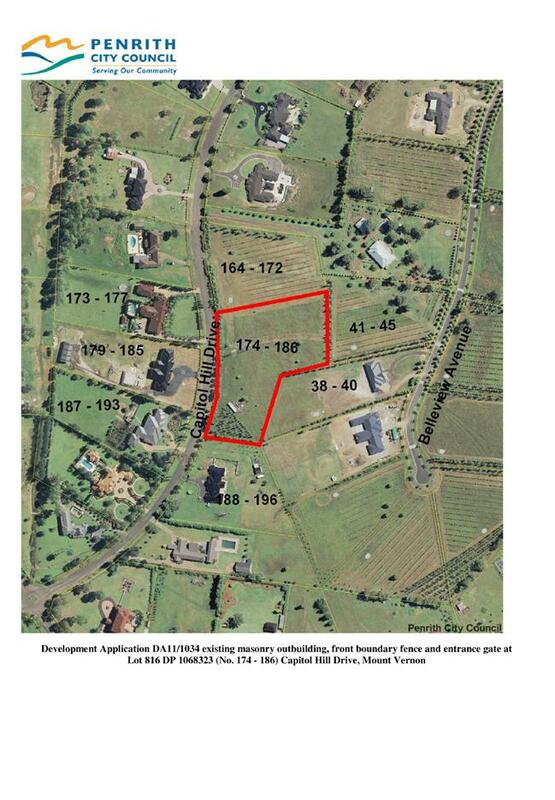 The subject site is a 1ha allotment situated in the semi-rural locality of Capitol Hill at Mount Vernon. The surrounding area is characterised by rural/residential development in a parkland type setting. The lot is irregular in shape with a frontage to Capitol Hill Drive of approximately 160m and varying depths ranging from 61.7m to 123.3m. The site has a gentle slope to the street (west). The site is constrained by an electrical easement approximately 60m in width that diagonally traverses the lot from south-east to north-west. Existing landscaping is located along the front boundary, the remainder of the site is clear of vegetation. The suitability of the shed structure was raised in a previous development application (DA10/1228) for a two storey dwelling, shed and septic tank. At that stage the shed structure had been partially built but encroached on the easement for transmission. The application for the dwelling was approved with the shed structure being deleted from the application due to the encroachment on the electricity easement. The current application seeks approval for the partially constructed shed. The proposal will partially demolish the building to remove sections that encroach upon the easement for transmission. The proposal also seeks approval for a new front boundary fence and entrance gates. The existing masonry building will be reduced in size from 121m² to 79.93m² with an overall height of 3.51m (refer Appendix No. 3). The existing timber rail fence along the Capitol Hill Drive boundary is proposed to be replaced with 1.8m high palisade style fence, masonry rendered and painted support columns with sandstone capping. The entrance gates will be of a similar style with a sliding gate setback off the front boundary. A separate 4.5m wide gate is also proposed to allow access by Transgrid to the easement and the tower situated on site (refer Appendix No. 3). The existing building envelope for the lot is located in the north eastern corner of the lot and is a triangle shape. This is due to the transmission easement which bisects the lot from south-east to north-west. The current location of the structure is in the south of the lot (refer Appendix No. 2). The following table contains an outline of Councils setback requirements under DCP 2010 and the setbacks of the existing masonry outbuilding. The table demonstrates that the existing structure complies with the minimum setback requirements under the DCP. As can be seen in Appendix No. 2 the transmission easement has greatly affected the subject lot restricting possible locations for ancillary structures to the dwelling. The available area on site for buildings is dictated by the electricity easement and in this respect the owners have a preference to retain the eastern area of the site for the main residence and surrounding landscaped gardens. The purpose of the setback and building envelope requirements was to create and maintain a streetscape character conducive to the rural setting, to allow for variety of setbacks and open space around the dwelling and to provide scope for comprehensive landscaping of developments. The existing masonry outbuilding has similar setbacks to the dwelling located to the south thus maintaining the streetscape and character of Capitol Hill Drive. The setbacks of the masonry building are greater than those of the adjacent dwelling to the south. The lot to the south did not form part of the subdivision thus the dwelling did not have to be built within a building envelope. The setbacks of the masonry building are greater than those of the established dwelling to the south maintaining building separation and preserving landscaping which the restrictive covenant seeks to enforce. The location of an outbuilding outside of the building envelope is not considered unreasonable as it keeps similar setbacks with development on adjoining lots and maintains building separation and existing landscaping. Due to the above issues, and the nature of the variation requested, it is considered that a variation of the building envelope, as proposed, would have minimal impacts visually or on the amenity or streetscape of the locality. The development has been assessed in accordance with the matters for consideration, under Section 79C of the Environmental Planning and Assessment Act 1979, and having regard to those matters, the following issues have been identified for further consideration. The provisions of SREP 20 apply to the property. SREP 20 aims to protect the environment of the Hawkesbury-Nepean River by ensuring that the impacts of future land uses are considered in a regional context. Of most relevance to the proposal is the potential impact on water quality. The compliance of the proposal with the general planning considerations, specific planning policies, and recommended strategies specified in Sections 4, 5 and 6 of Part 2 of SREP 20, has been assessed, and it is considered that the development application for the construction of a dwelling and outbuildings and the installation of the proposed On Site Sewerage Management System meets these requirements. The land is zoned E4 Environmental Living under the Penrith LEP 2010. 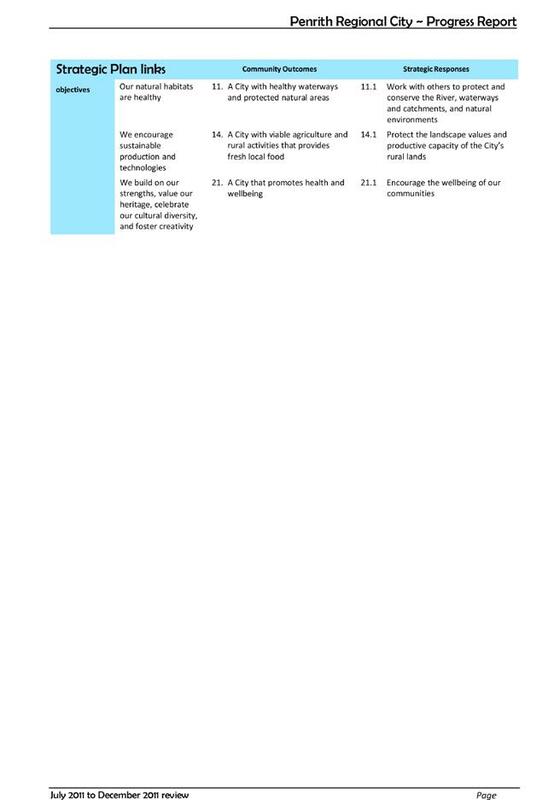 The aims and objectives of the Penrith LEP 2010 and objectives of the E4 Environmental Living zone are contained in Appendix No. 4. The building is considered to be a structure that is ordinarily ancillary to an approved ‘dwelling house.’ The proposed use of the shed is for storage of lawn care machinery, car trailer and power tools. 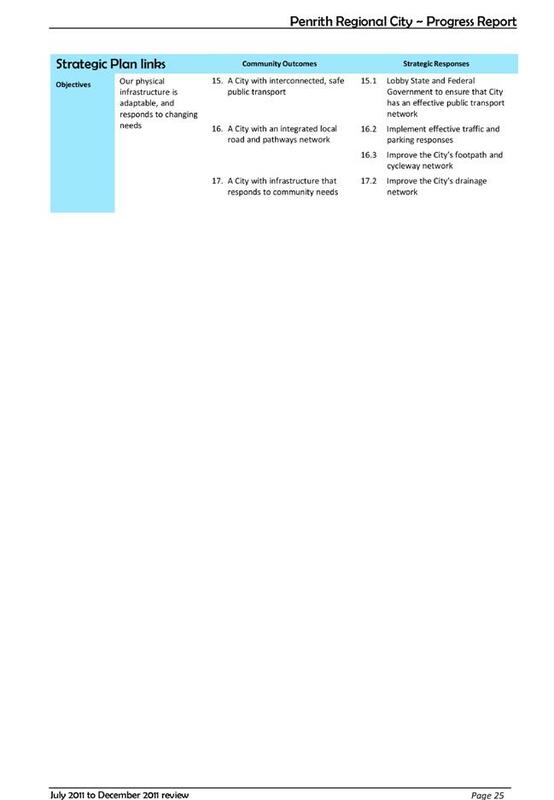 Subclause 2.3(2) of the Penrith LEP 2010 provides that Council must have regard to the objectives for development in a zone when determining a development application in respect of land within the zone. · The assessment of the proposal has considered adjoining land uses and the natural environment. 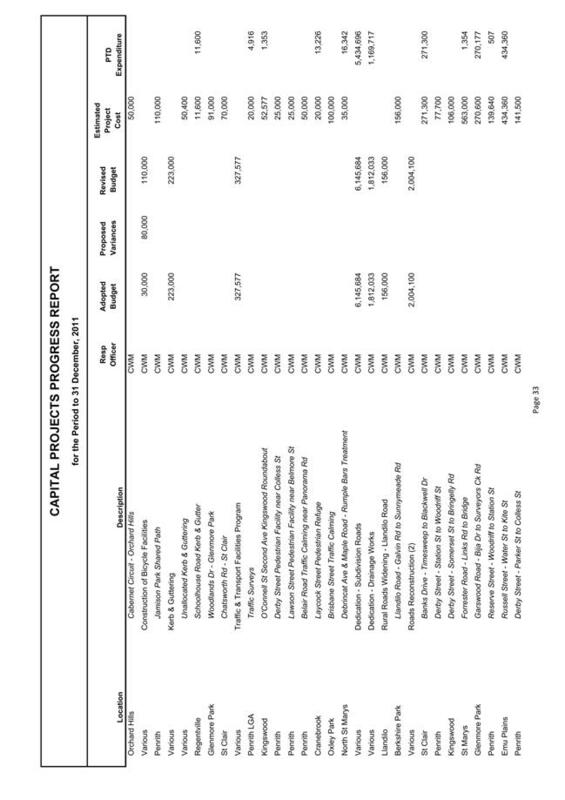 Table 2 Appendix No. 4 provides an assessment of the proposal against the relevant Part 4 Principle Development Standards; Part 5 Miscellaneous provisions; and Part 6 Additional Local Provisions of Penrith LEP 2010. The proposal is consistent with these special provisions. 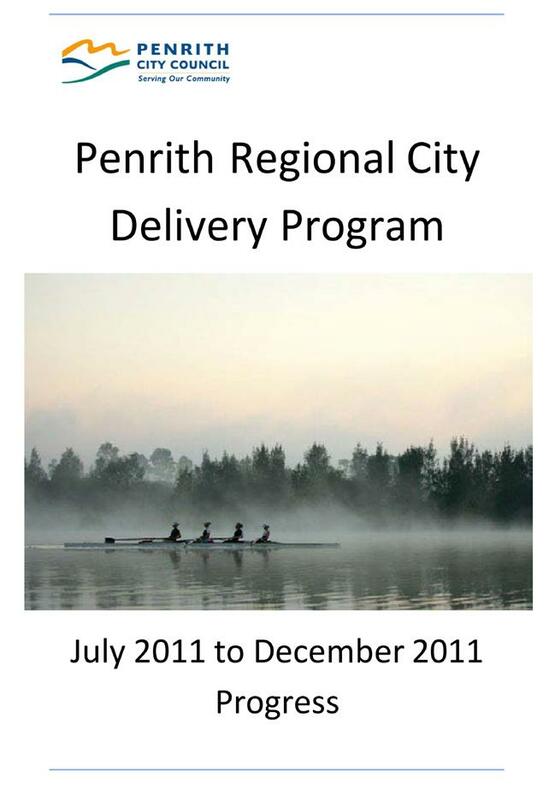 Penrith DCP 2010 aims to provides an opportunity for Council to fulfil its’ commitment to sustainability and creation of a Sustainable Penrith. Appendix No. 4 shows the relevant standards and how the outbuilding satisfies the requirements of Penrith DCP 2010. The proposed development would be likely to have minimal impacts in terms of access, traffic, public domain, utilities, heritage, or the use of agricultural land. · The development has been designed to be responsive to the site. Site disturbance/excavation and filling are minimized. · No vegetation removal is proposed. Additional landscaping will be provided adjacent to the front boundary. · The proposal will have minimal impact on the local road system as the building will be used for storage. 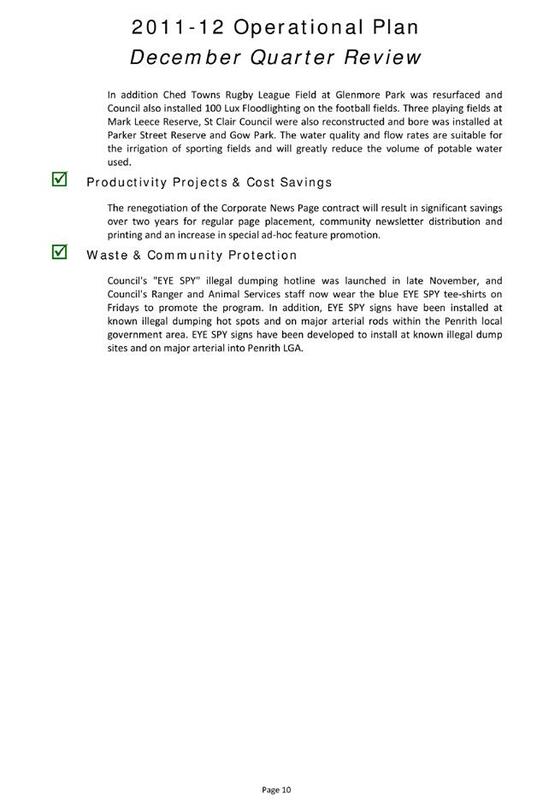 · Effluent Disposal – the masonry building will be connected to the septic system approved with the dwelling under DA10/1228. · The proposed development will have minimal impact on the amenity of the area and is in keeping with the surrounding and adjacent land uses. The proposed development fits the locality. Adequate separation is provided between developments on adjoining properties. Adequate services are available to the site. On site disposal of effluent has been approved for the approved dwelling on site. The toilet will be connected to this system. The site is not nominated as bushfire prone. It is not subject to flooding, contamination or slip. The site attributes are conducive to the proposal. In accordance with Council’s Advertising and Notification Development Control Plan, the proposed development was notified to the adjoining property owners. No submissions were received in response. Assessment of the application for the masonry outbuilding including variation to the 88B Instrument applying to the property demonstrates that it is generally in accordance with LEP and DCP requirements. Assessment of the application to vary the terms of Restrictive Covenant, fourthly referred to in the 88B Instrument attached to Lot 816, DP 1068323, has demonstrated that the proposal is unlikely to have any significant impacts on the achievement of the outcomes intended by the planning and subdivision controls for this property. The proposed variation will not compromise the character or amenity of the locality, and will not cause a significant reduction in the spatial separation, and perceived setbacks of development on the streetscape. 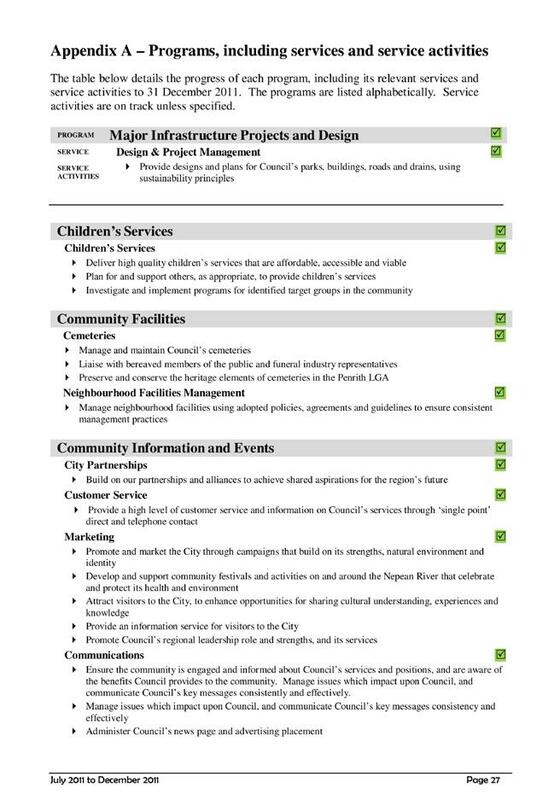 3.10 A copy of the Occupation Certificate and all necessary documentation supporting the issue of the Certificate is to be submitted to Penrith City Council, if Council is not the Principal Certifying Authority. In the event that a Compliance Certificate was issued by the Principal Certifying Authority certifying compliance that all conditions of the development consent required to be met has in fact been met as well as any documentation stated above, shall be submitted to Penrith City Council if Council is not the Principal Certifying Authority. A tender for the Scheduled Maintenance for Mechanical Services in Minor Buildings including heating, ventilation, air conditioning and refrigeration equipment, was advertised on 14 October 2011 and closed on 1 December 2011. Tenderers were invited to tender for the contract work on a lump sum fixed price basis without rise or fall for a period of three (3) years with further 2 x 1 year options. This report advises Council of the outcome of the tender process and recommends that the tender from CBD Mechanical Electrical be accepted. Tenders were advertised in the Western Weekender and the e-Tendering website on 14 October 2011 and in the Sydney Morning Herald on 18 October 2011. The purpose of this request for tender was to seek a contractor with the proven ability to deliver works to Council’s specification. The general scope of work comprises the scheduled maintenance and repair of air conditioning systems in minor buildings (generally split and small domestic systems). The scheduled maintenance shall be carried out in accordance with the manufacturer’s recommendations for each item of equipment in conjunction with Council’s specification based on The Australian Institute of Refrigeration, Air Conditioning and Heating DA 19 HVAC&R Maintenance schedules and the relevant Australian Standards as applicable to the equipment and systems. Repairs and call outs not identified in the maintenance schedules will be charged at the nominated hourly rate, and quotations may be called for major repairs or replacement of plant. This contract applies to the existing heating, ventilation, and air conditioning equipment currently installed and operating within the minor buildings that comprise part of the Penrith City Council’s asset register (approximately 62 buildings). It should be noted that the tender allows for the addition or deletion of plant or buildings from the list of assets over the contract period. The Tender Evaluation Committee consisted of Glen Tuckwell (Building Projects and Maintenance Coordinator), Graham Howe (Building Projects Coordinator) and Laura Schuil (Acting Supply Officer). Tenders were received from ten (10) companies for the supply of Scheduled Maintenance for Mechanical Services in Minor Buildings (approximately 62 buildings). Following a detailed analysis of all tenders, each tender was evaluated against the evaluation criteria. The evaluation was used to determine a final ranking for each tender. 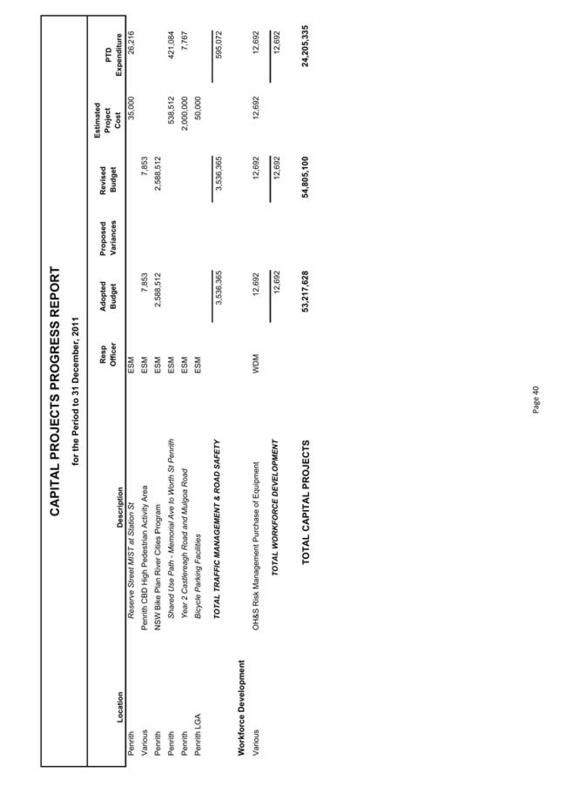 Consideration was then given to each of the tenderer’s lump sum and unit rates to determine the best value for money solution for Council. Based on all compliance and cost considerations, the following tenders were shortlisted and ranked in the following order. *Haden has allowed $15,160.00 for spare parts in their lump sum price. The tenders submitted by Haden Engineering Pty Ltd, Hannan Technical Services Pty Ltd and Celltec Air Conditioning Pty Ltd demonstrated their ability to perform the works, however there was no advantage to Council in further considering these higher priced tenders. The tender submitted from CBD Mechanical Electrical is considered to provide Council the most cost effective delivery for maintaining the mechanical services in Council’s minor facilities based on their high level of compliance, demonstrated ability to meet Council’s requirements, and competitive hourly or schedule of rates for the services offered. CBD Mechanical Electrical was established in 1982 servicing the Sydney metropolitan area. They currently service a number of statutory bodies including Waverley Council and Sydney City Council. The company specialises in servicing air conditioning, building management systems, electrical and fire safety systems. The Tender Assessment Group (TAG) comprising the Group Manager ~ Legal and Governance, Stephen Britten and the Senior Governance Officer, Glenn Schuil met to consider a tender for the Scheduled Maintenance for Mechanical Services in Minor Buildings including heating, ventilation, air conditioning and refrigeration equipment. Enquiries were made with members of the Tender Evaluation Committee about the recommended tenderer. The TAG was advised that Waverley Council had provided a good reference for the quality of the work provided by the recommended tenderer and that they were confident that the Council’s buildings could be inspected within the time allocated within the tender. Based on the information contained within the report, the TAG agrees with the methodologies used by the Tender Evaluation Committee and supports the recommended tender submitted by CBD Mechanical Electrical be accepted. 1. The information contained in the report on Tender Reference 11/12-06, Scheduled Maintenance of Mechanical Services Minor Buildings be received. 2. CBD Mechanical Electrical be appointed as the preferred contractor for the provision of Scheduled Maintenance of Mechanical Services in Minor Buildings for a period of 3 years for a lump sum price of $13,500 (ex GST, with the option to extend for a further two (2) X one (1) year periods subject to satisfactory performance. 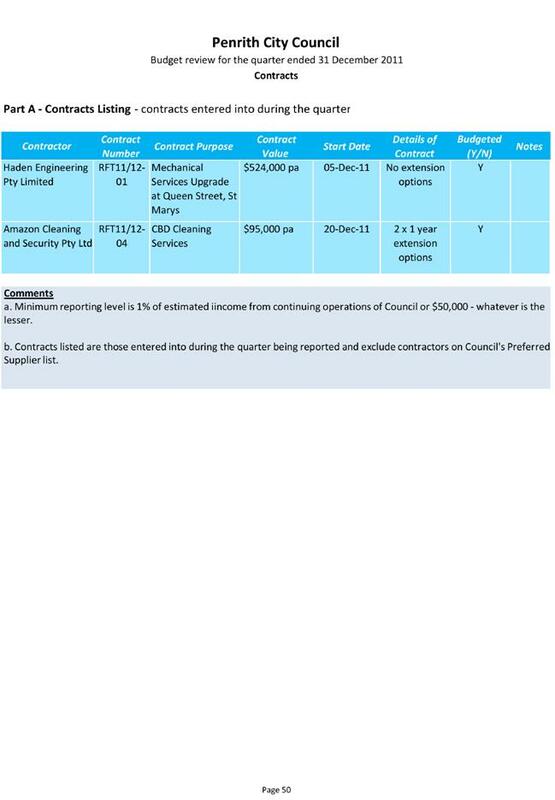 A tender for the Scheduled Maintenance for Mechanical Services in Major Buildings including heating, ventilation, air conditioning and refrigeration equipment, was advertised on 14 October 2011 and closed on 1 December 2011. Tenderers were invited to tender for the contract work on a lump sum fixed price basis without rise or fall for a period of three (3) years with further 2 x 1 year options. This report advises Council of the outcome of the tender process and recommends that the tender from Hirotec Maintenance Pty Ltd be accepted. The general scope of work comprises the scheduled maintenance and repair of air conditioning systems in major buildings. The scheduled maintenance shall be carried out in accordance with the manufacturer’s recommendations for each item of equipment in conjunction with Council’s specification based on The Australian Institute of Refrigeration, Air Conditioning and Heating DA 19 HVAC&R Maintenance schedules and the relevant Australian Standards as applicable to the equipment and systems. Repairs and call outs not identified in the maintenance schedules will be charged at the nominated hourly rate, and quotations may be called for major repairs or replacement of plant. This contract applies to the existing heating, ventilation, and air conditioning equipment currently installed and operating within the major buildings including the Civic Centre and Library, Community Connection, Joan Sutherland Performing Arts Centre, Penrith Regional Gallery, Ripples Aquatic Centre, Penrith Pool, Penrith Senior Citizens and Penrith Valley Arts Precinct. It should be noted that the tender allows for the addition or deletion of plant or buildings from the list of assets over the contract period. The Tender Evaluation Committee consisted of Graham Howe (Building Projects Coordinator), Joshua Martin (Asset Co-ordinator) and Laura Schuil (Acting Supply Officer- Contracts). Ultimate Air Conditioning & Electrical (NSW) Pty Ltd. 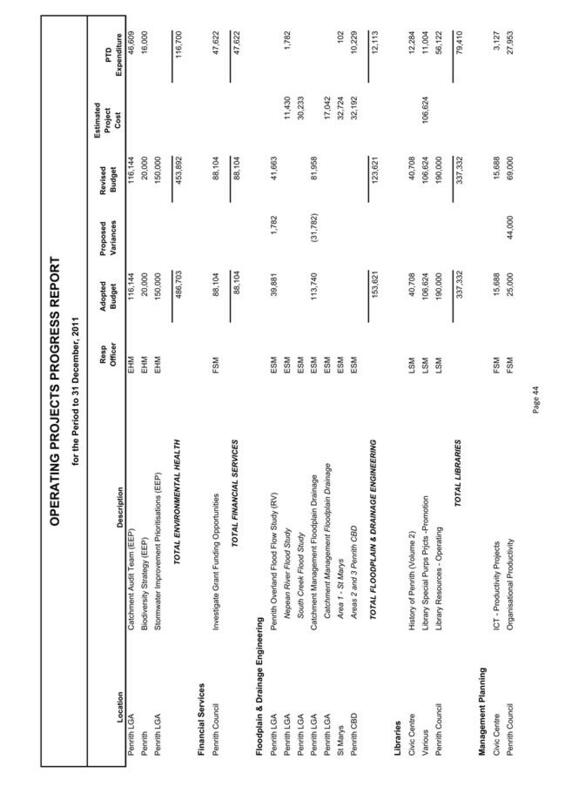 Consideration was then given to each of the tenderers’ lump sum, time/hours allocated per site and unit rates to determine the best value for money solution for Council. The tender from Ultimate Air Conditioning & Electrical (NSW) Pty Ltd while on the surface looks attractive, only estimated 110 hrs per annum to service all nominated sites. Council officers evaluating the tenders were concerned that this company had not allowed the appropriate time to service the equipment specified. An independent mechanical consultant (EnFact Pty Limited) was engaged to estimate the time to service the equipment specified in the tender document at the Civic Centre and the results showed that approximately 196 hrs annually was required to service the equipment. 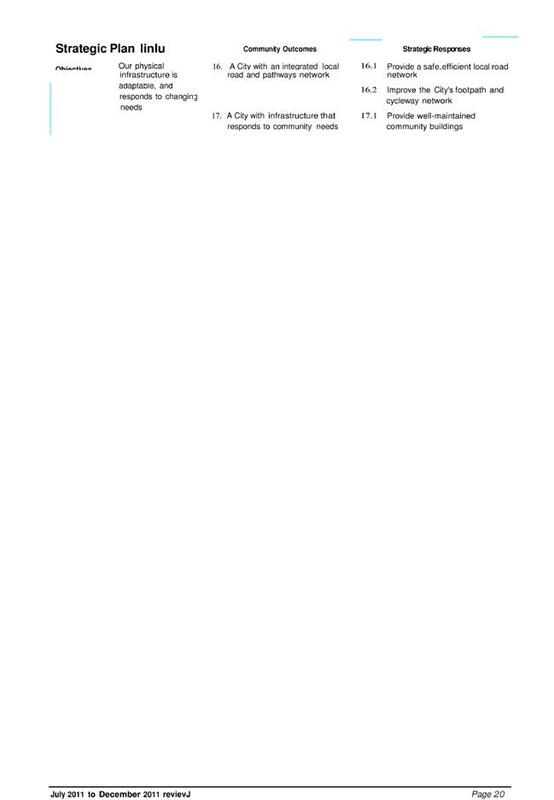 Ultimate Air Conditioning & Electrical (NSW) Pty Ltd only estimated 24 hrs per annum to service the equipment and this clearly shows that this company did not allow sufficient time to service the Civic Centre equipment, as specified in the tender documents. The time estimated to service other nominated sites is also below estimates to service equipment to specifications and it is not considered that this company would be able to service the equipment to Council’s specification within the lump sum price submitted for the work. 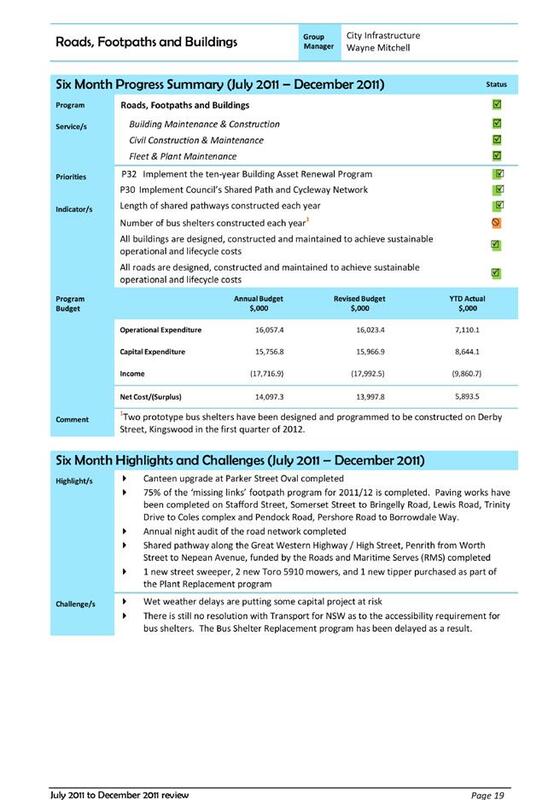 The tenders submitted by Haden Engineering Pty Ltd, Fredon Air Pty Limited and Allstaff Airconditioning (NSW) Pty Ltd demonstrated their ability to perform the works, however there was no advantage to Council in further considering these higher priced tenders. The tender from Hirotec Maintenance Pty Ltd is considered to give Council the most cost effective submission for maintaining the mechanical services in Council’s major facilities based on their high level of compliance, demonstrated ability to meet Council’s requirements, and competitive hourly or schedule of rates for the services offered. 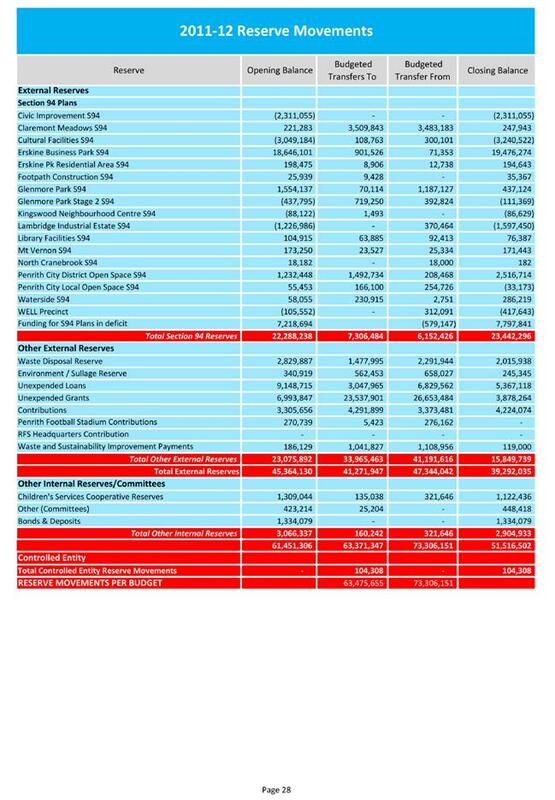 It should be noted that Hirotec had allowed 163hrs annually to service the equipment at the Civic Centre, although this is under the time estimated by the Consultant it is considered to be a realistic timeframe. Clarifications during the tender evaluation confirmed that tenderers had allowed for servicing all of the nominated equipment to Council’s specification regardless of time estimates included in the tender submission. Hirotec are Council’s current contractor at the Civic Centre and have serviced the facility for approximately 5 years. The company was established in 1972, and has grown to become one of Australia's leading privately owned facility maintenance businesses, based in Kingsgrove, NSW. The company is well established with national operations and close to 200 staff. Hirotec is a privately owned national company specialising in the maintenance and engineering of integrated technical solutions comprising Mechanical, Electrical, Fire and Energy services. The Tender Evaluation Committee is confident that Hirotec can service the sites for the lump sum submitted. Included in the assessment of tender was the commissioning of independent reference checks, financial analysis and performance analysis on Hirotec Maintenance Pty Ltd. 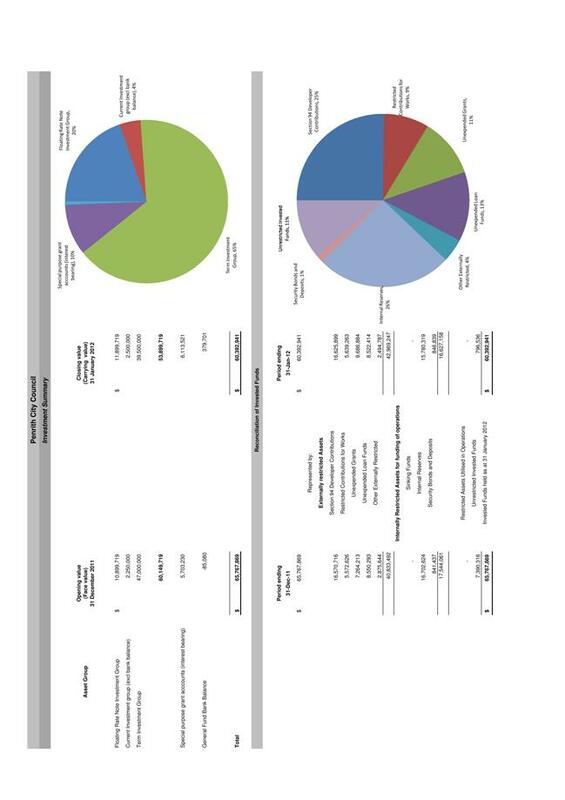 These checks were completed by Corporate Scorecard Pty Ltd and have been reviewed by Financial Services. Based on this review, no concern was raised as to the ability of Hirotec Maintenance Pty Ltd to perform the works described. The Tender Assessment Group (TAG) comprising the Group Manager ~ Legal and Governance, Stephen Britten and the Senior Governance Officer, Glenn Schuil met to consider a tender for the Scheduled Maintenance for Mechanical Services in Major Buildings including heating, ventilation, air conditioning and refrigeration equipment. Enquiries were made with members of the Tender Evaluation Committee about the tender submitted by Ultimate Air Conditioning & Electrical (NSW) Pty Ltd. It was suggested to the members of the Tender Evaluation that an independent consultant should be engaged to evaluate the tender submitted by Ultimate Air Conditioning & Electrical (NSW) Pty Ltd.
Based on the information contained within the report, the TAG agrees with the methodologies used by the Tender Evaluation Committee and supports the recommended tender submitted by Hirotec Maintenance Pty Ltd be accepted. 2. Hirotec Maintenance Pty Ltd be appointed as the preferred contractor for the provision of Scheduled Maintenance of Mechanical Services in Major Buildings for a period of 3 years for a lump sum price of $170,994.78, with the option to extend for a further two (2) X one (1) year periods subject to satisfactory performance.